Last Thursday one carload of hikers was treated to the sight of a cougar ambling across the highway near Maple Falls. 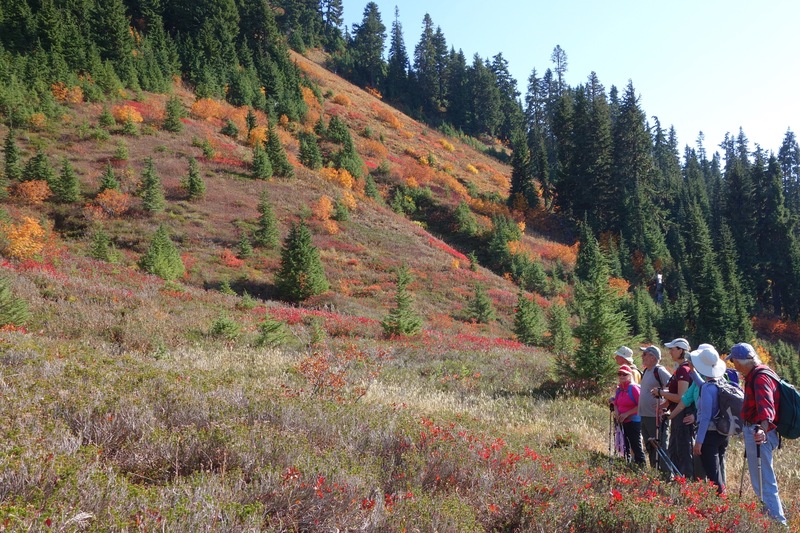 Not to be outdone, five of us headed east on Saturday to explore Cougar Divide. I had recently added it to our fall schedule – it had always been on of my favorites but I hadn’t been up there in years, partly because of the 12-13 miles of often very rough and occasionally precarious driving on Wells Creek Road and partly because of a perennial dense infestation of mosquitoes at the trailhead. On the one hand I’d heard reports that some folks from Glacier have been working to keep the road open. And there was hope that the extremely dry summer and some recent frosty nights would have knocked the mosquito problem down. So off we went. As I mentioned, this was one of my favorite hikes. 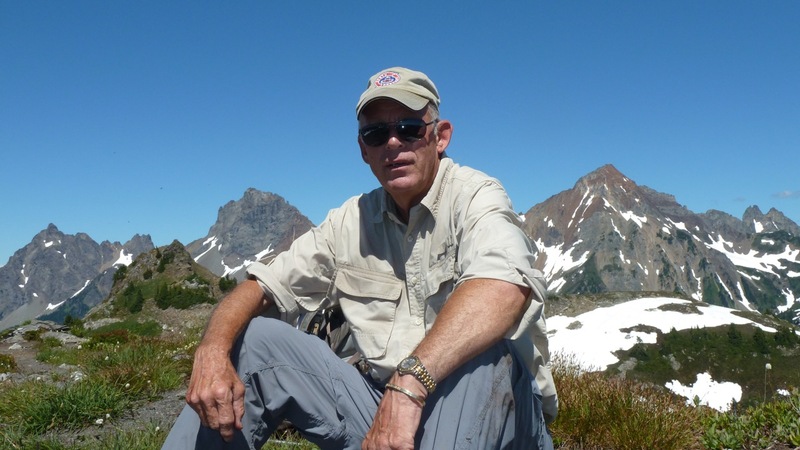 Several years ago, when the road was washed out by Wells Creek, I hiked 7 miles up the road and 3 miles out the trail and spent a magnificent cloudless and moonless night in the shadow of Hadley Peak and Chowder Ridge. But several trips had been marred by rainy weather and those mosquitoes and that kind of stuff can stick in your mind. However, it didn’t take long to remember why I loved this hike. We were still 5 or 6 miles from the trailhead when this sight forced us to stop and take some pictures. The trail is anything but boring. 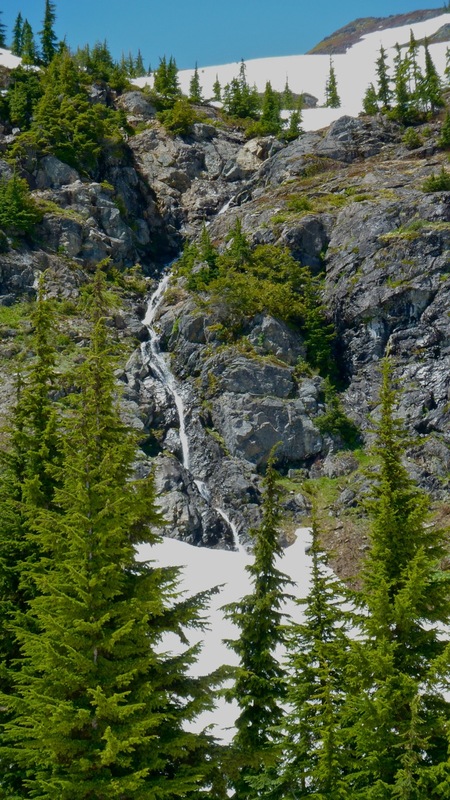 It was dropped from the Forest Service’s official hike list more than ten years ago and has not been maintained in any organized way since. It is only 3 miles long with 1000′ of net elevation gain but there are lots of ups and down, some of them steep and scrambly; it passes through dense forest and open meadows; and there are lots of fallen trees to climb over, under and around. But overall, it is a pretty moderate hike. It starts with a moderately steep uphill, mostly in open meadows, for about half a mile until it pops up onto a rock outcropping that I’m calling the Beauty Spot. BTW you can enlarge any picture (please!) by clicking on it. The lighting on this perfectly clear day just got better my the hour, Here’s a view on our way back in one of the meadows – the flowers are mostly gone and it is ready for the new snow that will be coming all too soon. And finally, I can’t resist one more picture, taken as we climbed back up onto the Beauty Spot. Oops! I almost forgot to mention that the road is, in fact, in considerably better condition than the last time I was here. It is still 12 miles long and has a number of very bumpy sections, but there are no serious ground clearance issues and the exposed, scary spots have been much improved. And the views! And best of all, not a single mosquito and hardly any bugs of any kind. So the whole high country hiking season could possibly slam shut at the end of this week. But we can hope. On Saturday Fred and I drove up into the mountains to investigate the old “Keep Cool” trail as a possibility for this Thursday’s hike with the Senior Trailblazers. 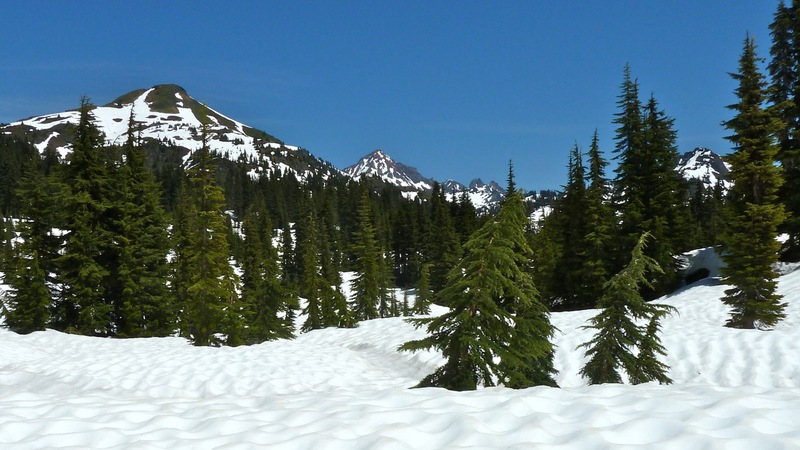 We are still bedeviled by the extraordinary snowpack in the North Cascades, a residue from heavy snowfalls during the spring months. 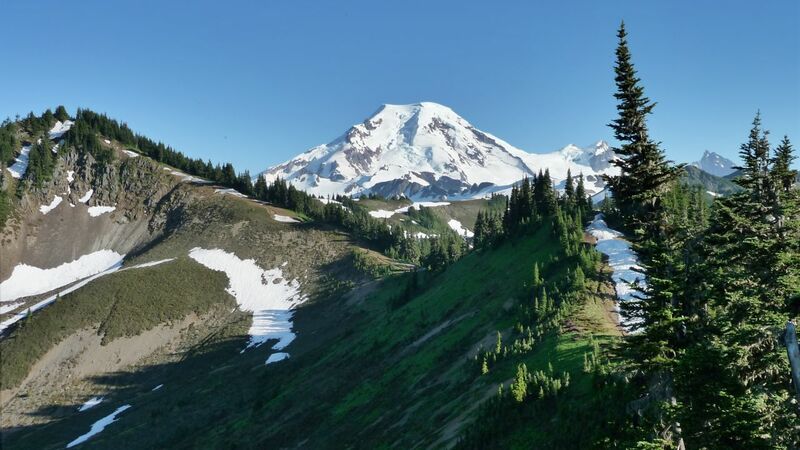 We are scheduled to go on the new Yellow Aster Butte trail but the Forest Service says that it is only open and snow-free for 1.25 miles, about the point where the trail curves around to the north side of a ridge. 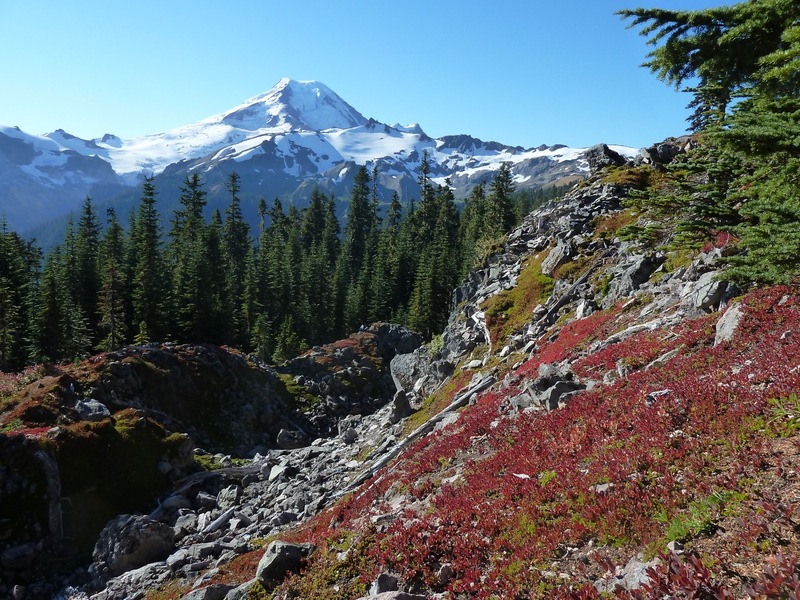 I know just the place they are talking about as I have been there and done that – the trail winds around in a meadow and gets lost under the snowpack and then, if you manage to find it, climbs up the side of a steep slope before it comes out into the sun again. 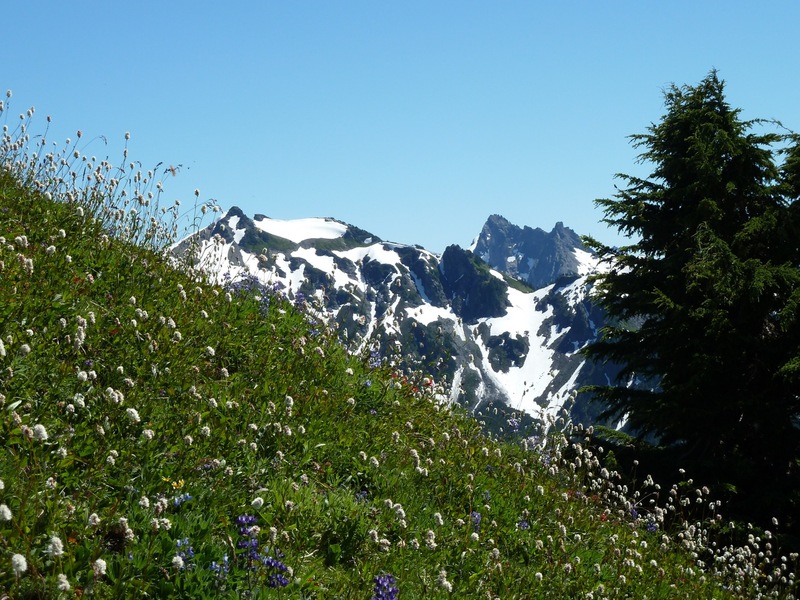 The Keep Cool trail is the old route to Yellow Aster Butte. 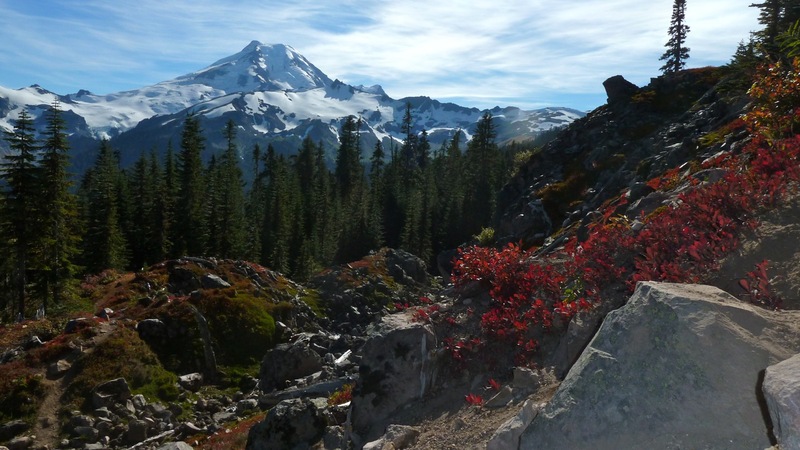 It starts at about 3000 feet (500′ lower than the new trail) and has something for everyone. 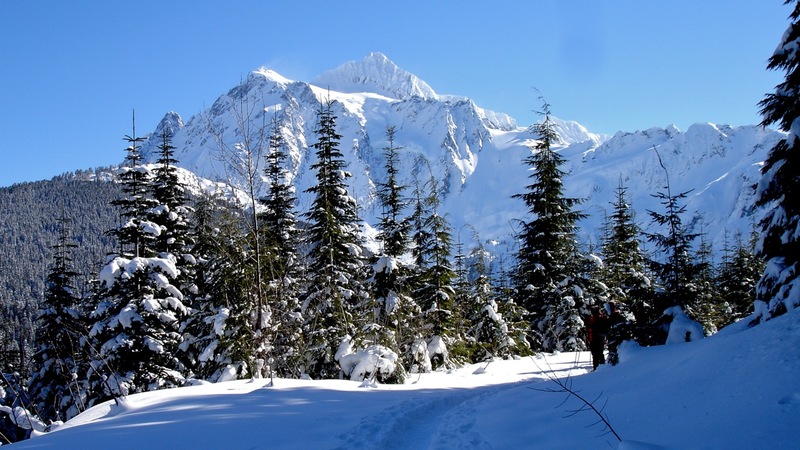 It starts gently on an abandoned logging road (with some nice views of Shuksan and Baker) and then goes on a somewhat steeper, even-longer-abandoned road. Then there is a short stretch (2-300′) where it does a credible imitation of the steepness of the Welcome Pass trail before coming to a wooded ledge or plateau at about 4000′. 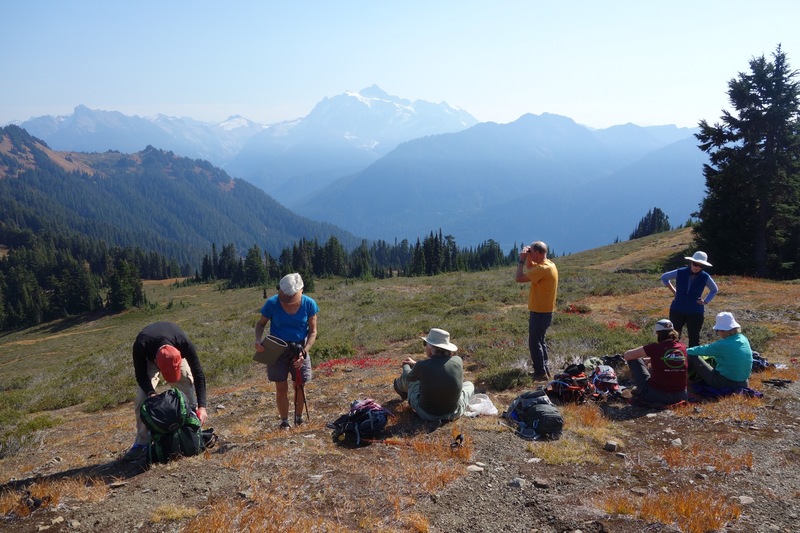 Then it repeats that ditty of steep-and-level a couple more times before it curves around to a lovely, open meadow at 4700′ with great views of the surrounding mountains before the last steep push up to the little lakes at the base of Yellow Aster Butte and Mount Tomyhoi. The hope was to get to the meadow at 4700 feet. 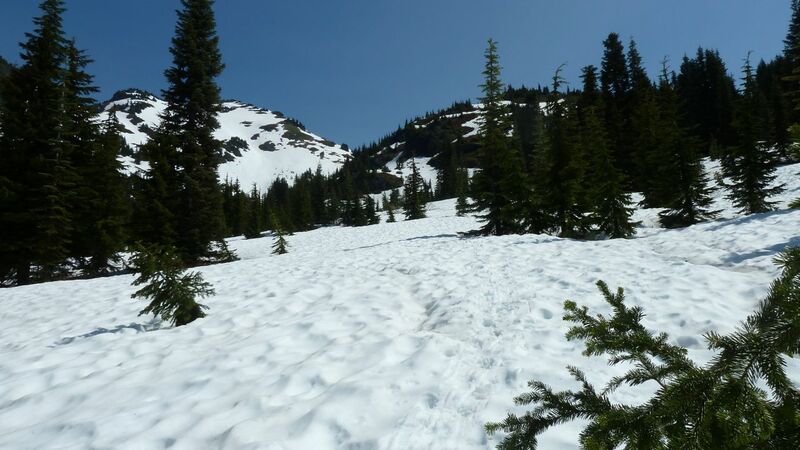 When I was there about three weeks ago (July 5) with DJan, Kathy and Verne we lost the trail in solid snow at that first ledge at 4000′ and had quite a difficult slog from there on. 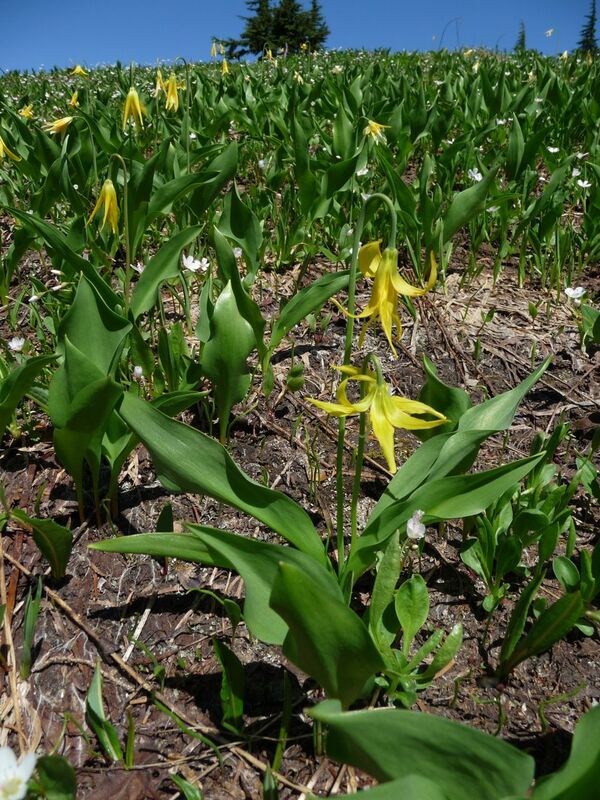 The combination of Verne’s considerable experience on that trail and my good GPS track from last September brought us to the high meadow, but it was very hard work and not very suitable for a group hike. Would three weeks make a difference? One small complication was that I did not have my good high-sensitivity GPS unit, having left it in Dennis’ car after Thursday’s hike. I dug out my old Garmin eTrex low-sensitivity and and its archaic RS-232c serial adapter and managed to put my good track onto it, but the combination of high, steep hills and dense trees in our area were always a bit much for it. With considerable inconvenience I guess I could have put the track onto Fred’s high-sensitivity unit but didn’t bother, hoping that my recent familiarity with the trail, combined with some melting of the snow, would get us by. Since this trail has been abandoned by the Forest Service for about ten years it can be pretty brushy, especially in the more level areas. Shortly after we got started I was surprised to realize that Fred was not right behind me, since he can walk a lot faster than me. Then I heard some snipping and saw that he was using his pruning shears to cut back the brush. 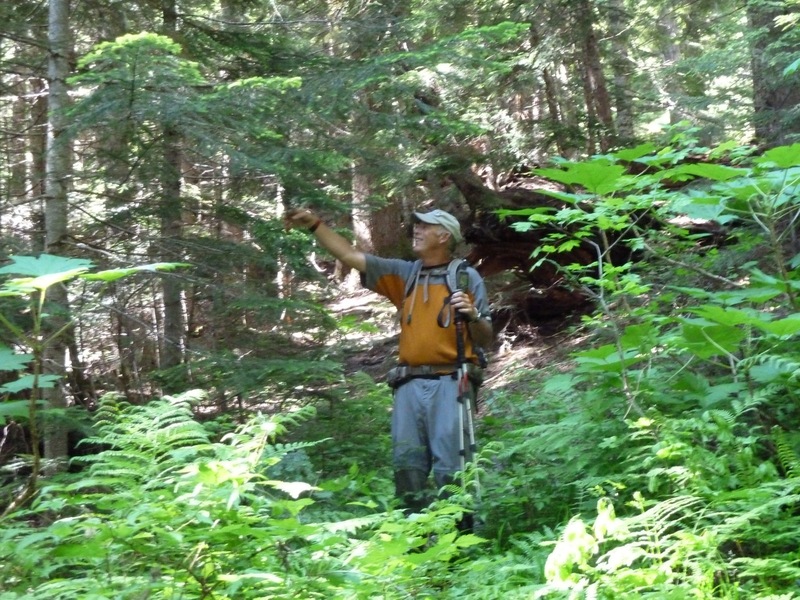 Later on he pulled out his saw and cut off a 4-inch tree that had fallen across the trail. I was a bit disappointed, but not too surprised, when we got to that first ledge at 4000′ and saw that it was still covered in snow. 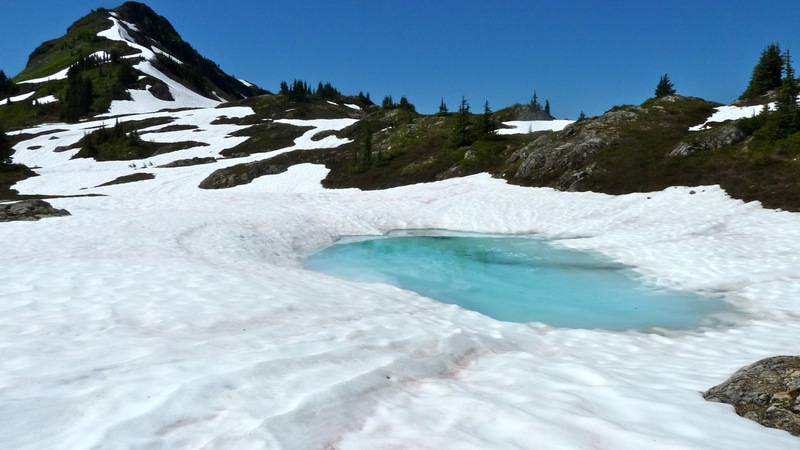 But it was not quite as deep as before and there were a lot more bare spots, which gave me hope that the trail might emerge on the other side, where it begins to climb up another steep slope where the snow can’t accumulate to such depths. As expected, the old eTrex GPS was doing an excellent imitation of a paperweight – no signal at all. And my instincts didn’t do much better, as I led us well off to the left of the trail. But the snow did diminish as the hill got steeper, and we somehow managed to find a little scrap of the trail as it passed under a huge fallen tree. We followed the trail for awhile, then lost it and found it again a few more times before the snow became solid again and we had to just wing it. On the map you can see our “progress”. 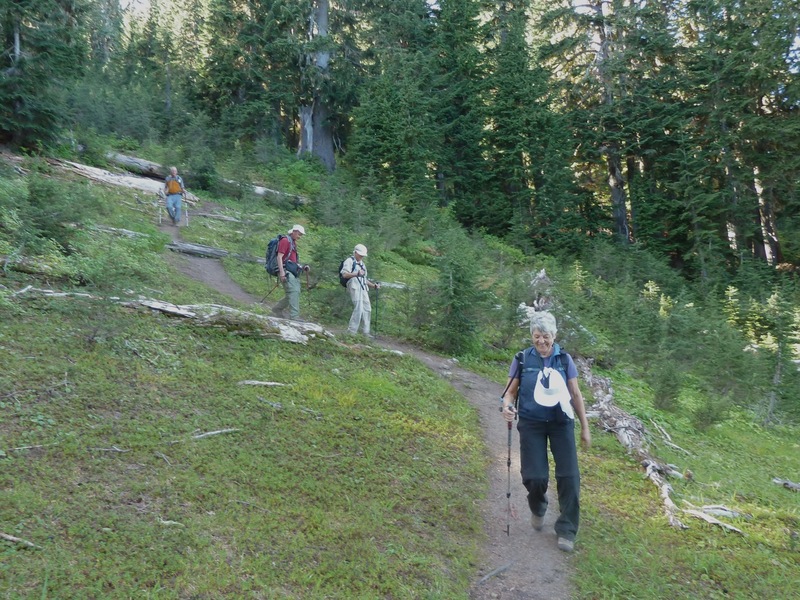 It shows the upper part of the trail from the 4000′ ledge to the upper meadow. The brown line (sometimes dashed) labelled “Trail” is the trail shown on my map – it is so approximate as to be almost perfectly useless. The yellow line (bounded by black, with little red arrowheads) is my good track from last fall when the trail was snow-free. The brownish-red line is the upward bound track that Fred recorded yesterday, showing considerable deviation from the trail. If you click on the map to expand it you can see near the bottom (near point #1) where we lost the trail and then found it again. Near point #2 you can see where we missed a sharp right turn and went well uphill from the trail – very hard work, but we did come to an open spot where the eTrex finally managed to snag a good enough signal to tell us that we were quite a bit above the trail. On a lot of trails you can do alright by just heading uphill when in doubt, but if you look closely at the contour lines you can see we were already almost up to the level of the high meadow, and that going further up would take us into a creek valley that would miss our destination by quite a bit. Not to mention being very steep and wooded. So we turned and tried to stay on the level and head to the east and get back near the trail. But it is very hard to bushwhack on the level, so we reluctantly gave up some of our hard-won elevation gain to get back on a more sure course. The eTrex would lose and regain the signal so we were still flying blind at times – you can see near point #3 where we overshot the trail on the low side shortly after we got to it. That meadow is such a lovely place! It would be a great destination for Thursday’s hike, but the way we had gotten there would not do at all. But we agreed that if we could do a better job of following the trail going back and put up some orange flagging and have all our electronic gadgets in good working order, it just might be doable. As promised, on the way downFred put up some flagging tape (and did some more brushing). We agreed that this would be a reasonable pick for Thursday’s hike, given the very limited choices available. There is bit more snow travel than some might like but the flagging assures that we will stay on a reasonable course. And there are no scary places (like steep side slopes.) It is steep in spots, but nothing we can’t handle, and a lot less brushy than it was on Saturday morning. 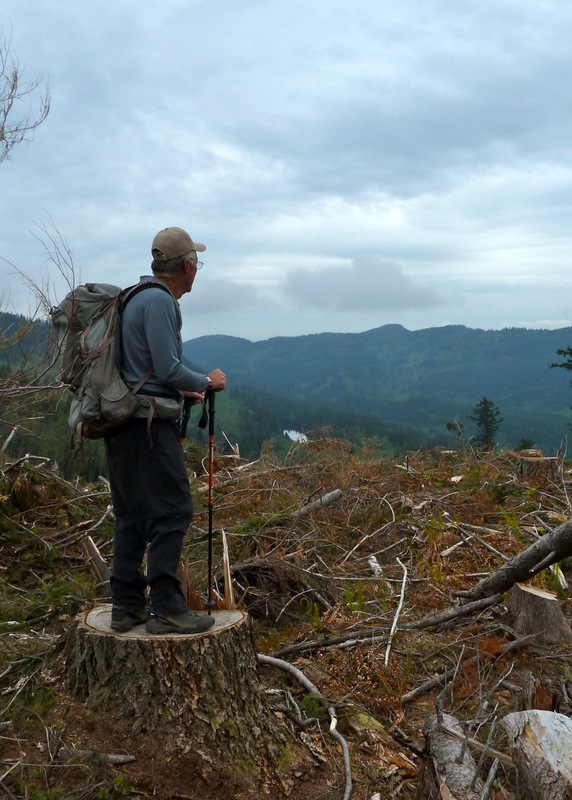 Last fall a clear-cutting operation on a parcel of private land adjacent to Larrabee State Park destroyed some informal trails that had been used for years to complete some loop hikes on the south end of Chuckanut Ridge. On the map to the right the so-called “Burnout Road”, officially known as South Chuckanut Road, is the brown line in the lower portion, leading from the Clayton Beach trailhead to what I’ve labeled as “South Chuckanut Hill”. (You can enlarge the map by clicking on it.) 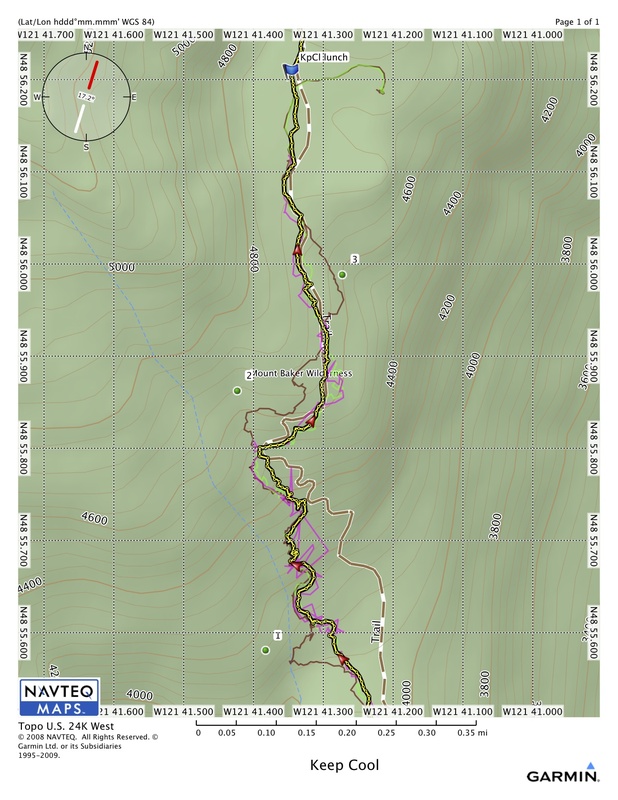 The light and dark blue lines near the top comprise the South Lost Lake Trail. The newly logged area is roughly square, with the corners near South Chuckanut Hill and the Lost Lake Junction. The green and orange lines are the boot-built trails that were more or less obliterated by the clear-cutting. The green line is called the Overlander Trail on some maps. Yesterday (May 24) Fred and I hiked up to see if we could find a way to resurrect the two loops that have used this area: the Burnout Road hike, which followed the road and the orange line and part of the green line to connect with the South Lost Lake trail and return via Fragrance Lake; and the South Lost Lake lollipop, which came up in reverse to the Lost Lake Junction, followed the green trail around to the east side of Lost Lake (which is just off the map to the north), and the dark blue line back to that junction. I was hoping to find a better way across the logged area than that big zigzag using the orange trail – if you blow up the map you can see that it drops down quite steeply and then climbs steeply back up the green trail. It’s good exercise but the hike is hard enough without that bit. Maybe we could just strike a bee line across the clearcut and save some climbing. Shortly after we started up the road we were met by semi-trailer truck rolling slowly down. This is not the sort of thing one often sees on these logging roads – graders, back hoes, logging trucks maybe, but a full-sized semi? [Is it a contradiction to call something a “full semi”?] Further on we found a large slash pile, one of those loaders with a big claw on the end of an articulated arm and a huge chipping machine. Also a sign announcing that the area was open to hikers and bikers despite the ongoing “Biomass Recovery Project”, which made my day, since I always enjoy a fresh new euphemism. Or perhaps that’s not the right word for it – “euphemism” is usually used to mean a nice name for something naughty, but this is just a fancy name for something simple, like “sanitation engineer” for sewer worker. The other cute thing about this post-logging cleanup operation is that the company name on the trucks was “Barker’s Chipping Service”. So what seems to be going on is that dump trucks drive up to the logged site where another of the big articulated claw things loads them up with logging debris (or “slash”) which they bring down and dump on the pile at the chipping site. Then they chip all stuff into the big semi (which probably has an open top). This all sounds very industrial, but it didn’t really disturb our hiking experience much. The chipping site, or Biomass Disaggregation Station, was uninhabited and quiet since the semi had taken off with its load of chips. We met a couple of loaded dump trucks coming down the road and one empty one passed us on its way back up. Up at the logging site I was surprised by how small it looked. We could see across some low hills to the tree line marking the state park line and to the Biomass Accumulation and Lading Site (i.e., the claw thing). The road continued on but we couldn’t see exactly where because of the hills. We climbed up onto a nearby hill that seemed to be the highest point in the clearcut and were treated to some nice views despite the cloudy skies. 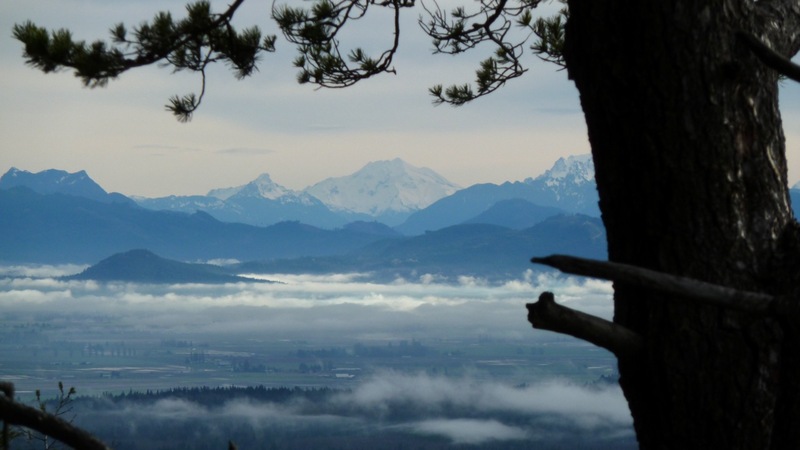 In the picture above, the view spans from Lookout Mountain and Lake Samish on the left to Blanchard Mountain on the right; at the extreme right you can just barely see the cliffs below Oyster Dome; on a better day Mount Baker would rise over the foothills just left of center. There was also a fine view over the water to the west but I didn’t get any good pictures. The one on the left shows Fred surveying the domain (the bright spot near the center is Lost Lake) from atop the big stump where we stopped to have an early lunch and discuss where we should go exploring. Fred had been up in this area last fall with a friend just as the logging was getting started and he was interested in trying to find the paths they had used; I was still leaning toward the bee-line approach. Since we had plenty of time, we settled on going back to the road and following it toward the claw thing and see if we could get to that area where the green trail turned east and then explore to the east. We strolled along the road through a gentle S-curve, all the while studying the tree line for signs of openings that might have been trails. Just after reaching the place where the green trail should have been we saw something trail-ish heading east and followed it over a rise and down into a gully, but it soon petered out. 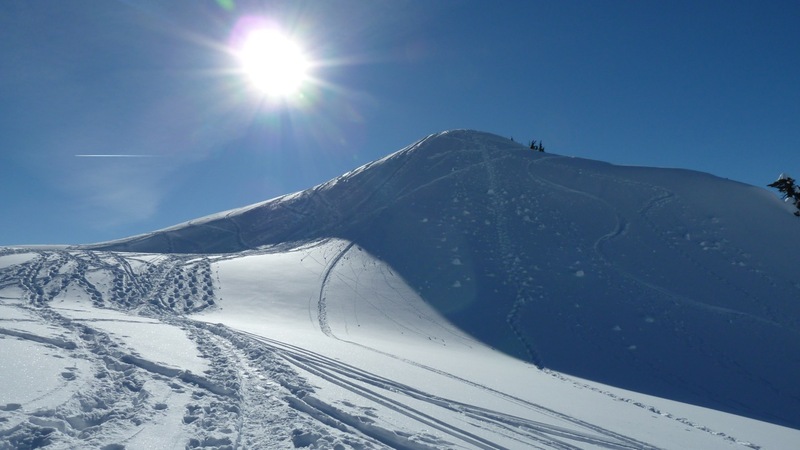 We then tried to head north – the slope was too steep for me so I headed back up the gully while Fred went straight up the hill. Neither of us found anything promising, so we regrouped on top of the hill and once again studied the tree line, which was pretty close now. I was by now close to certain that the old trail was along or pretty close to the new road and that we could easily get there in just a few minutes. So it was a good time to explore for the other trail. We picked a spot on the tree line and headed for it. When we got there, I couldn’t see anything promising and was tempted to head straight west along the tree line back to the road, but Fred headed straight north into the woods and I followed merrily along – it was still early and we were close enough to the goal that we couldn’t get into any serious trouble. And sure enough we soon stumbled across a nice, wide trail heading east and west (at the point labeled 00510, if you’e following the map.) To the east it headed steeply downhill, heading in the general direction of the old green trail. We followed it for a couple hundred yards to get a better idea of its destination, but I was not eager to follow it too far – going all the way down and around Lost Lake would had several more miles to our outing and backtracking would not be easy (did I mention “steep”). For good measure, we walked back out into the clearcut, where the trail very shortly joined the new road, and on to the point where we’d left the road earlier. 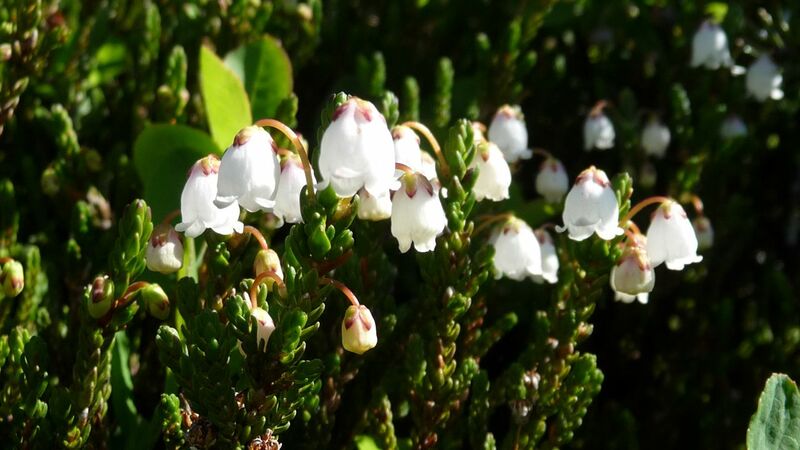 We were fairly pleased with ourselves, having found some viable hiking routes, so we headed out to the north and took the Fragrance Lake and the Interurban trails back to the car. We went a total of almost 10 miles, but that includes all our wandering and backtracking. The old Burnout Road loop is doable. On the positive side there are great new views from The Stump and along the new road (less than half a mile). The negatives are the 4 miles up Burnout Road itself and, in the short term, the truck activity on that road. The industrial activity was not a big deal in the clearcut; just the occasional slow moving truck. The chipping operation, which has to be pretty noisy, is a good ways down the road. Another possibility would be coming up the Fragrance Lake trail and up to The Stump for the view, and back the same way. This would avoid most of the the truck traffic and almost all of the road hiking. And it looks like the old green trail around Lost Lake has been at least partially replaced by a different trail through the woods. But this will require further investigation. 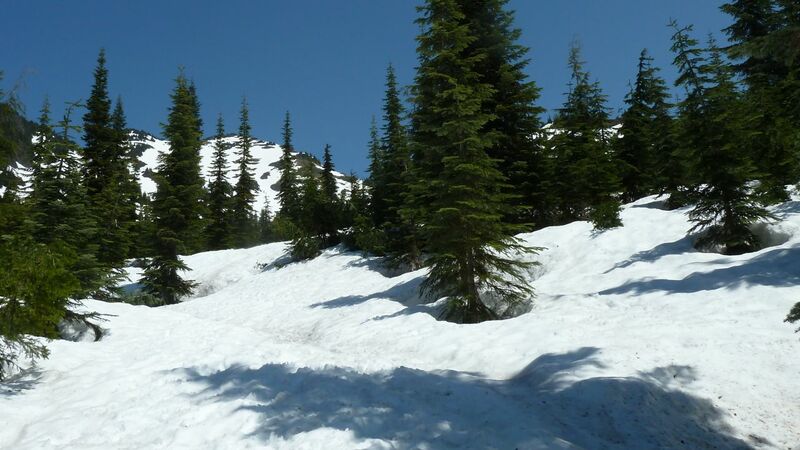 At the most recent planning meeting for the Trailblazers we responded to the heavy snow conditions in the Cascades by pushing the high country hikes back a couple of weeks into June and tentatively replacing them by Burnout Road and Cub Creek. The main reason we went on this Expotition was to check the viability of that choice. My reaction is positive. Any discussion? What a day to forget my camera! 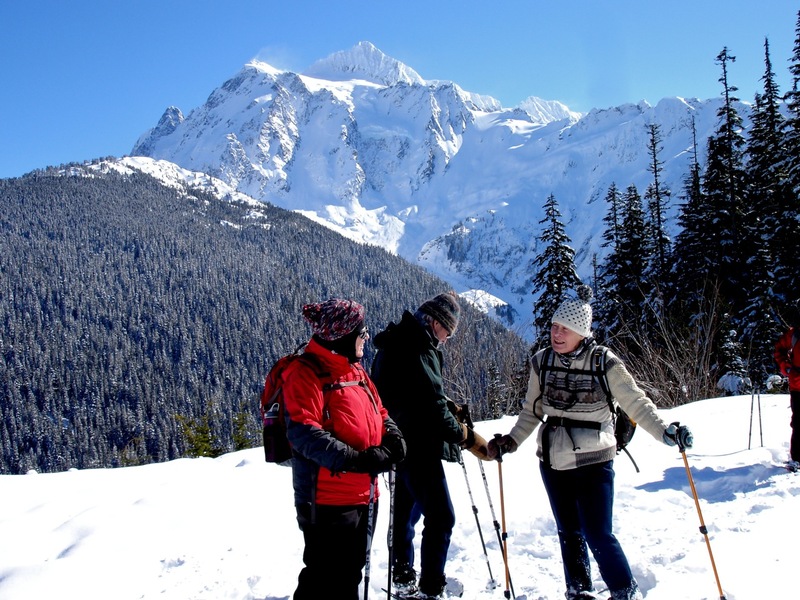 After two Thursday hiking washouts in a row, on Friday I decided to join a Mount Baker Club snowshoe hike led by Marjan, since it looked to be a beautiful sunny day. Up in the mountains the temperature was only expected to climb to about 10 degrees F, but you can’t pass up a beautiful sunny in February around here, can you? Can you? A lot of people can, as it turned out. 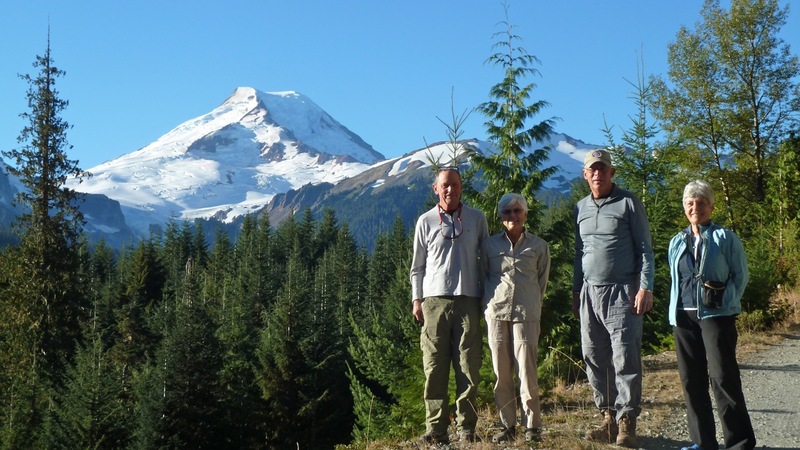 The day before, another sunny but cold day, only Marjan, Frank and I showed up at the Senior Center for the scheduled hike to Goose Rock. I had already given up on driving to Goose Rock that day, since Skagit and Island Counties had borne the brunt of last week’s late winter storm – on Tuesday evening the Deception Pass Bridge, which is adjacent to Goose Rock, had even been closed by snow. There was some snow in Bellingham but the roads weren’t too bad, so I figured we could find somewhere local to hike. 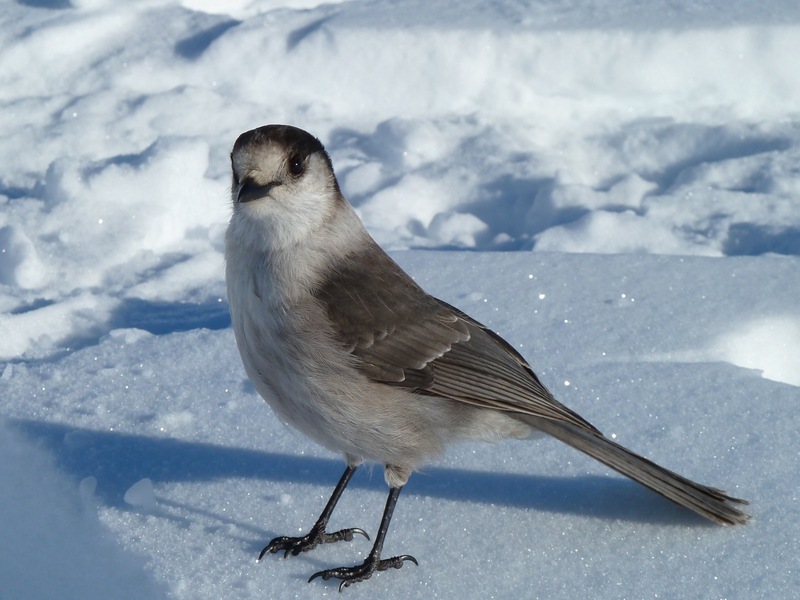 But the only ones who showed up were from the northern part of the county, near the Canadian border, where there was no snow at all. Since it was cold enough for all prudent people to bring their brass monkeys indoors, we three decided to bag it, do some shopping and return to our burrows. You think it's cold and windy down here? 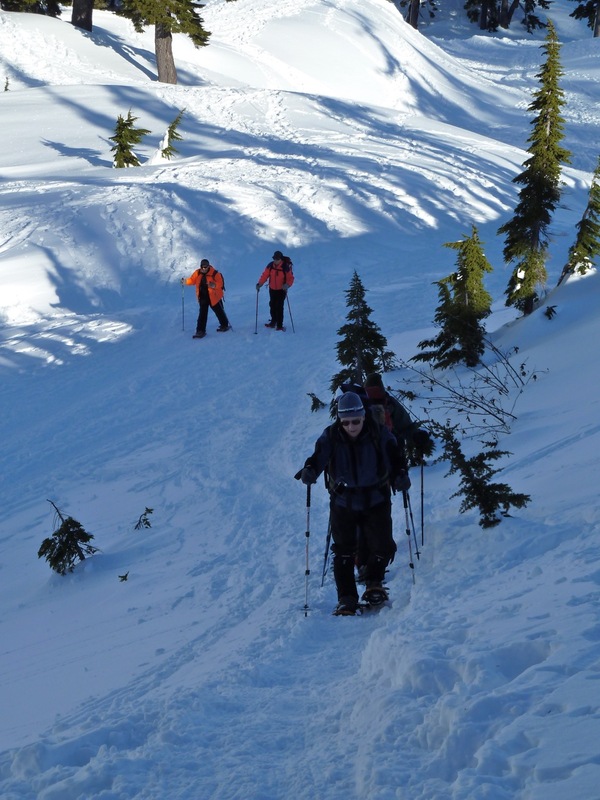 The turnout was bit better the next day for the snowshoe outing – eight hardy souls met in Maple Falls and decided to head for the White Salmon trails, one of the less avalanche prone areas. It took us quite awhile to get started but then we had delightful, if not very exciting, hike. Which is good, since a lot of the forms that “excitement” can take in those conditions are not very pleasant, to put it mildly. But I didn’t have my camera – I had been careful to attach it to the waistband of my pack the day before, but then I changed packs and missed it during the swap. But Aha! I keep my old Sony camera in the car for just such emergencies. I took it out of the console, turned it on, and before I could even aim it the flashing battery-with-a-slash-through-it icon appeared and it shut itself off. I thought maybe I could get off one picture if I really hurried, so I set the dials carefully, choosing the scenery setting so that it wouldn’t need to try to focus the lens, wishing that I had enough time to turn off the LCD display since that uses a lot of power, pointed it roughly toward some waiting hikers with Mount Shuksan in the background, pushed the Power button, and as soon as possible pressed the shutter release. I heard the reassuring sound of a click, and the camera immediately shut itself off. I couldn’t look to see if I’d really gotten a picture, since that would surely burn up any chance of squeezing out any more. And there was still some hope of that, since some types of batteries can recover a little bit of vigor if they sit unused for awhile. I know that was true of the old-fashioned carbon-zinc batteries we used as kids, but did it apply to modern super-super “Info-Lithium” energy packs? What the heck, it was worth a try, so I took the camera along with me. 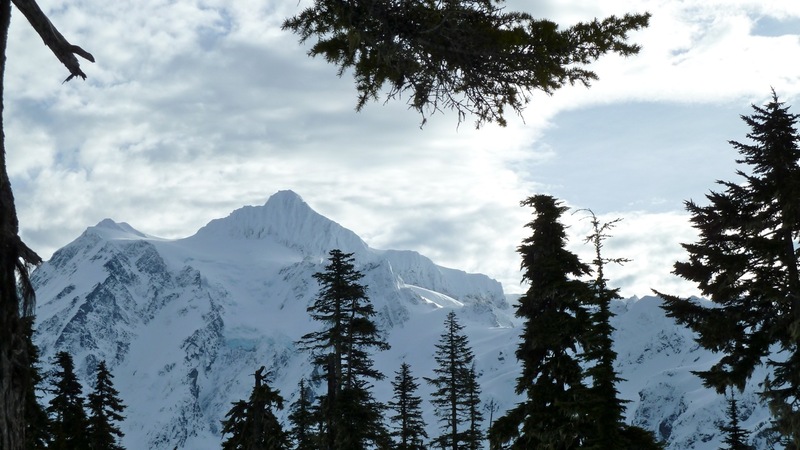 After we’d been hiking past some gorgeous views of Mounts Sefrit and Shuksan, some seldom-used part of my brain got my attention and reminded me that battery output is generally very much affected by heat, of which we had very little, indeed. Certainly the outside pocket of my jacket, where the camera had taken up residence, was only marginally warmer than the great outdoors and was probably still well below freezing. And my pants pockets would probably be worse, since legs don’t really heat up much. A shirt pocket would be great, but neither of my shirts had any. If I just tucked it inside my coat it would almost certainly fall out into a powdery drift. And besides, even though the camera is a small one it is still a pretty decent block of metal and would soak up a bit of heat before it got to the battery. OK, dummy: So take the battery out of the camera! Now we’re getting somewhere. The battery pack is a dainty little package, less than an inch and a half square and about a quarter-inch thick. It would fit in my mouth, even, but I was looking for a somewhat drier environment than that. Of course, just about any place on my person that was really warm was not going to be very dry since I sweat like a horse. It would fit in my glove, but I needed my hands for my trekking poles. I could stick it in my armpit, but that wouldn’t be very secure as long as I’m moving my arms. And if it did drop I might not be able to find it in my clothes. I decided to wait until we settled down for lunch and then try slipping the battery into my armpit while I ate. I stuck it between my two shirts and that worked fairly well, but it was very hard to keep it in place and I dropped it several times. It wasn’t too hard to find it since I was sitting still and it only fell as far as my waist. 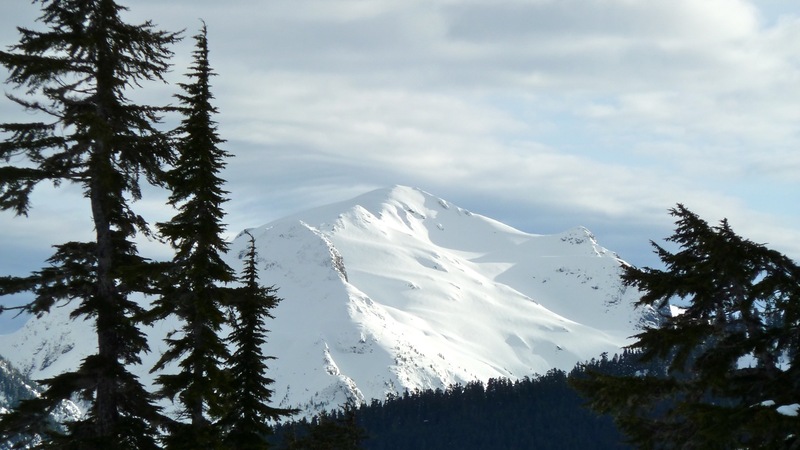 I managed to grab another picture that showed the snow whipping off the summit of Mount Shuksan. It was pretty clear that the armpit trick wasn’t going to do for the rest of the hike, since it had barely worked while sitting still. I will spare you the details (which would fall into the sphere popularly known as “TMI”) but suffice it to say that I did manage to get several more pictures on the return trip. The day was capped nicely by a stop at the ever popular North Fork Beer Shrine, Pizzeria and Wedding Chapel. 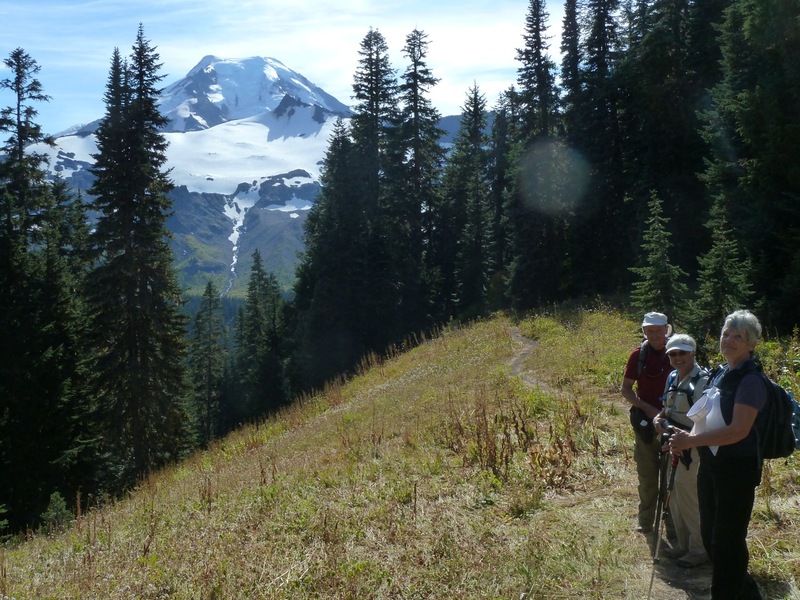 We have had a break from the rain in the last week or so, allowing for three beautiful hikes. The first three weeks of January were very wet – I measured over 7 inches of rain, well over the average for the whole month, which is generally one of the three wettest months of the year. It is also about one-fifth of our average annual rainfall. Between the 5th and the 24th there were only two days without rain. 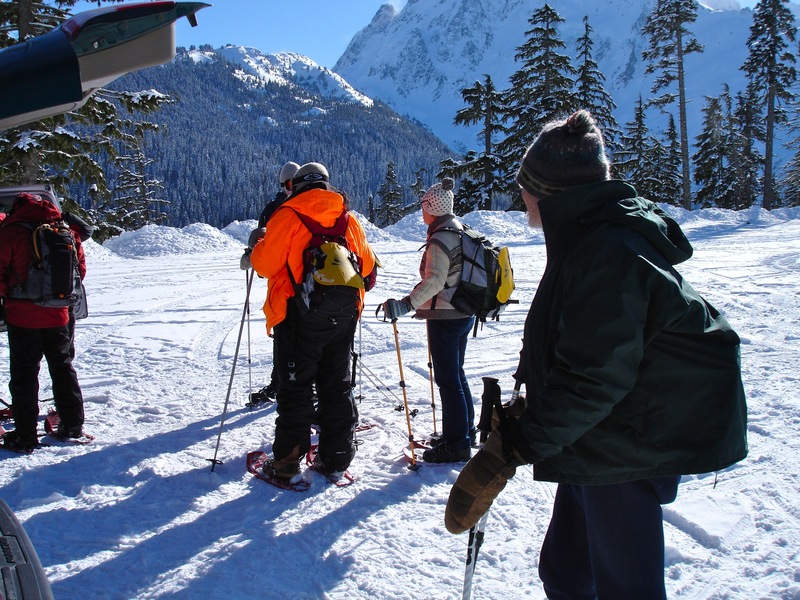 Last Wednesday the forecast looked great, so a bunch of us headed up to the the Mount Baker Ski Area, hoping to snowshoe up to Artist Point for some of the superb views. The weather didn’t quite live up to the forecast but there was some sun when we arrived – unfortunately the higher elevation areas were closed for avalanche control work. 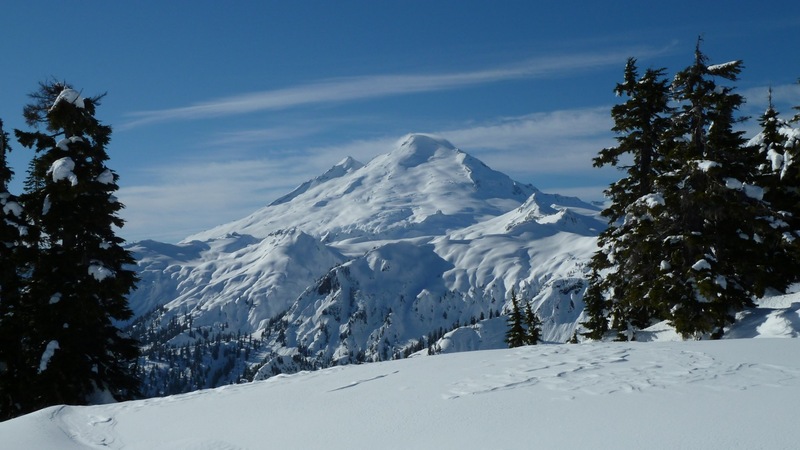 Ironically, the Northwest Weather and Avalanche Center had listed the avalanche danger for the day at its lowest level. So Marjan led us on a loop down and around the ski area. 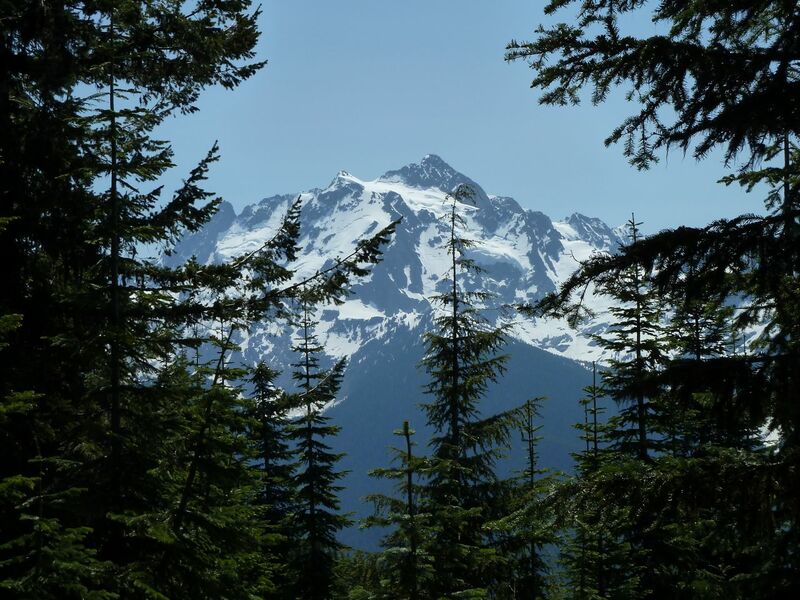 Most of the time we were away from the built-up areas and had a nice hike in the woods with frequent views of Mount Shuksan. The most excitement came about midway when we had to cross the highway. Normally this would be pretty uneventful, but the eight-foot-high vertical walls of packed ice and snow on each side of the road spiced it up a bit. 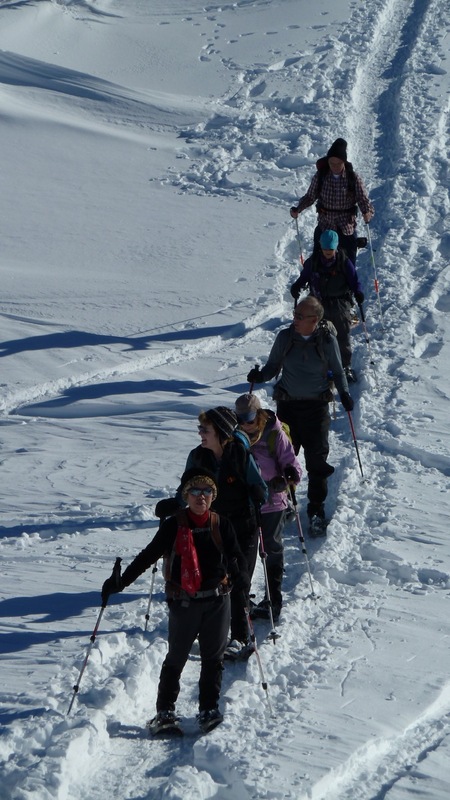 Getting down to the road wasn’t exactly easy, but hauling ourselves back up onto the snow was a real struggle. I finally got a chance to use the plastic scraper-shovel thing I’d been hauling around for about 8 years. There were some other places where we had to struggle up some pretty steep slopes and the sun withdrew some of its support as the day went on. By the time we got back to the cars it was pretty chilly and windy. But the sun still peeked through now and then, lighting up the snow in places and making for some eerie, almost monochromatic scenery. 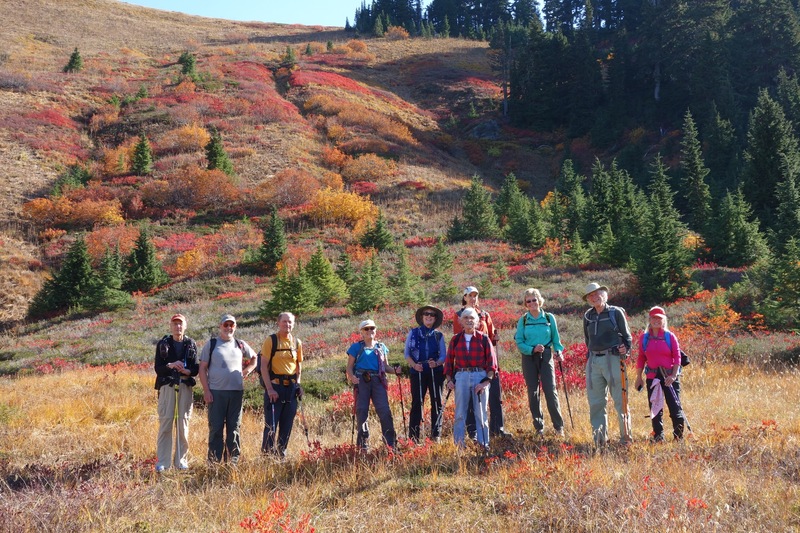 The next day was even nicer for the weekly hike of the Senior Trailblazers. 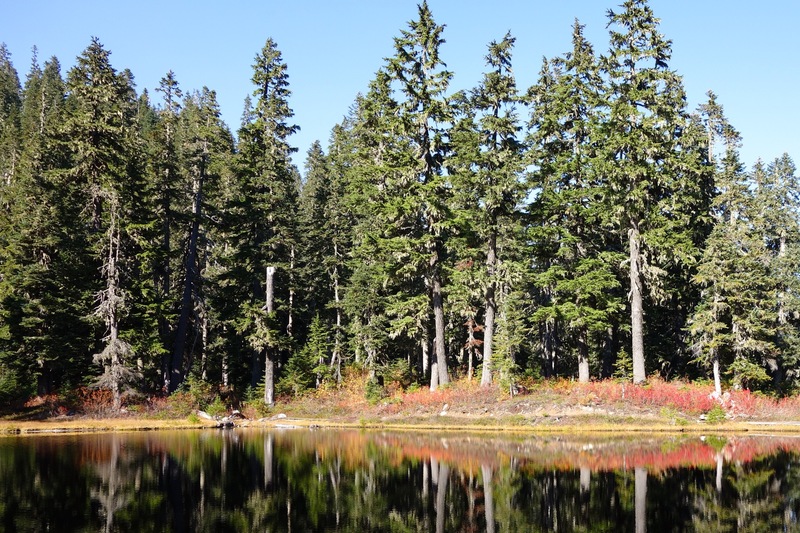 We would have gladly settled for just a dry day but after driving through some fog we found full sun at the Heart Lake trailhead in the Anacortes Community Forest Lands on Fidalgo Island. 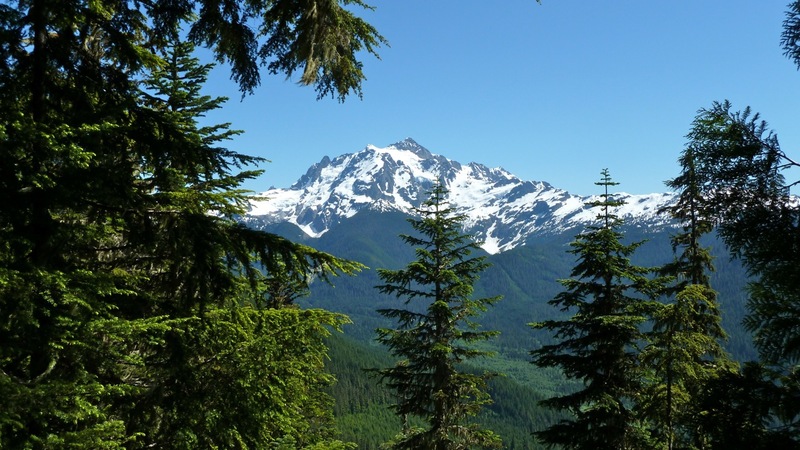 We enjoyed a nice strenuous climb through the woods to the summit of Mount Erie where we were greeted by a view that was truly spectacular, even by the standards of our glorious Fourth Corner. We were standing in full sun but there were high clouds adding color interest to the sky. To the south, looking over Campbell Lake and Skagit Bay, the sky had a salmon-colored hue; the fog still lingered over the lakes and bays; and that lump on the horizon is Mount Rainier, almost 120 miles away. It is rare to see Rainier at all from this distance, considering that we are looking over or through the smog a major city, but on my telephoto pictures you can even see distinct detail on the mountain. A first. Further to the west the Olympic Mountains, only about 30 miles away, were glowing in full sun, but I neglected to take a picture. 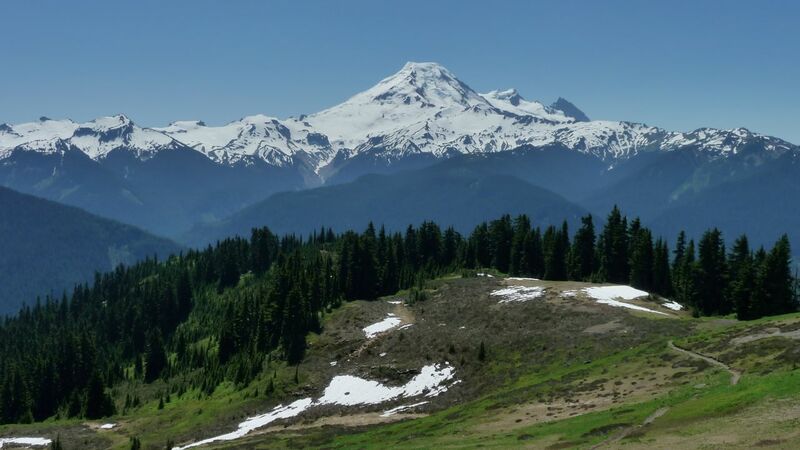 To the southwest was a rank of western Cascade peaks, including Three Fingers, White Horse and White Chuck Mountains, presided over by the least known of the major Cascade volcanoes, Glacier Peak. 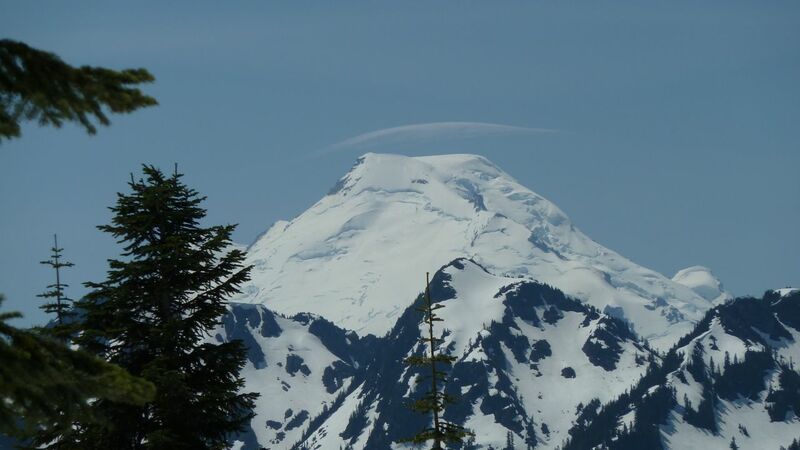 It is as tall as Mount Baker but it is very rare to get a good look at it, since it is sits well away from the populated sea level strip of Washington and is surrounded by medium sized mountains. From another overlook a short distance away we could look out over Anacortes and its oil refinery (famous for a recent explosion) toward Mount Baker, the local favorite. After a bit more rain over the weekend we were promised almost a week of fine, cold weather. 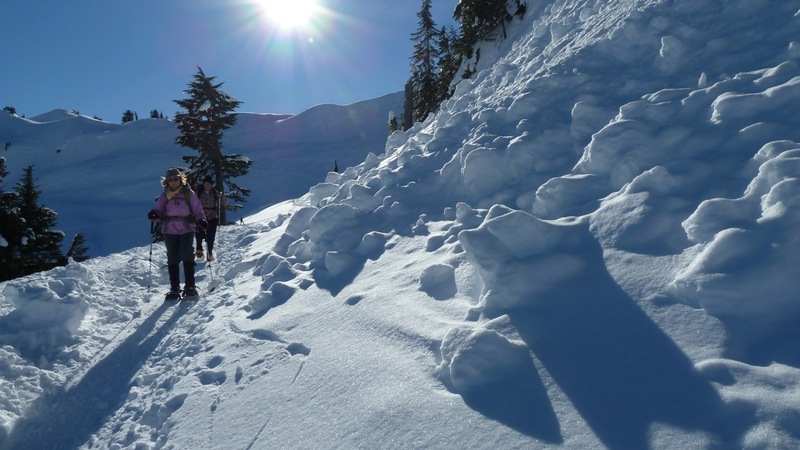 So a group of 7 set off Tuesday for the Ski Area and another attempt to reach the Artist Point area. 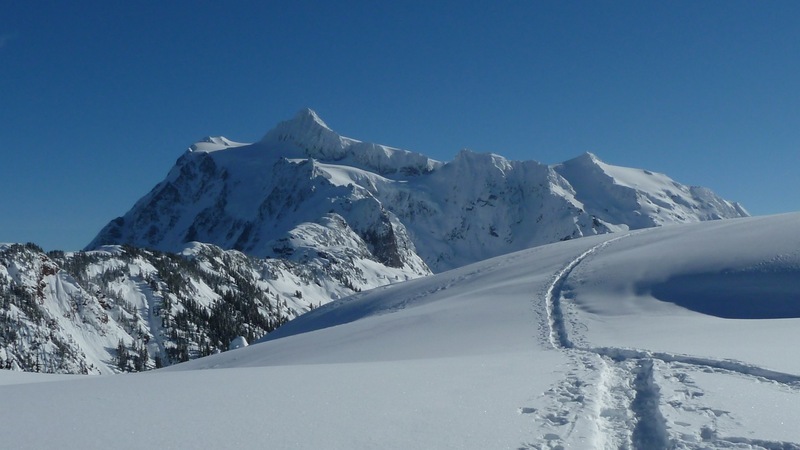 The day was sunny and cold and the avalanche danger was rated at the lowest level, so we were eager to get to that spectacular scenery that had been denied us on our last two snowshoe trips. 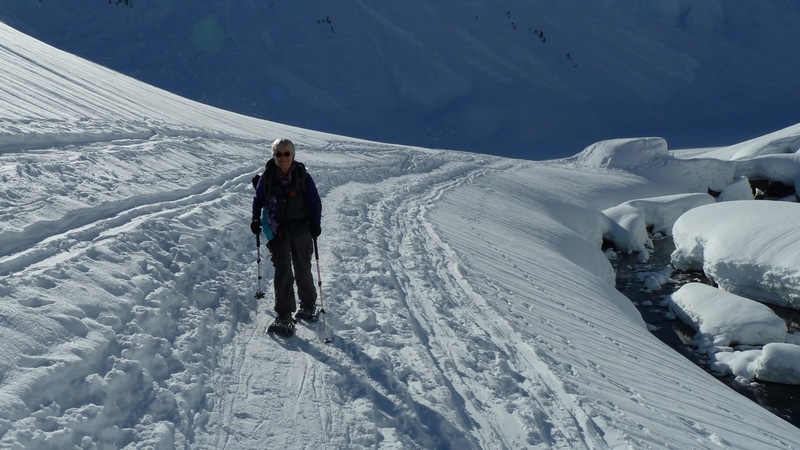 It was only the second snowshoe outing for two of our hikers, so I really hoped we wouldn’t get snookered again. And the Weather Service nailed this one – just a perfect day! The only possible complaint that anyone could come up with was that the sky was a bit too blue – not enough clouds to add interest to the photos. [Which reminds me of a time when I was first getting to know my first wife’s family, who owned and ran a fairly prosperous farm in the fertile Lake Erie bottomlands of southeastern Michigan. I had heard my father-in-law complain about the weather being too dry or too wet or too cold or whatever. It was always something. Then one summer we had warm, sunny weather with enough spring rain to germinate the crops but not enough to flood the fields, etc., etc. Perfect, right? Surely Tony would be pleased. 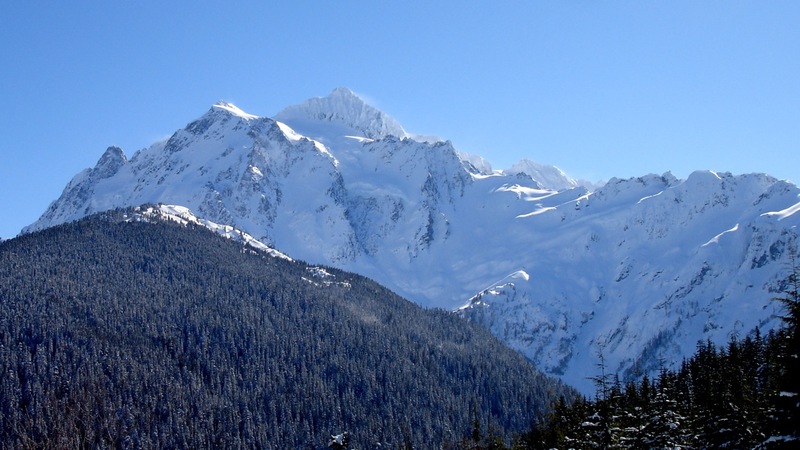 We made it to Artist Point and on to Huntoon Point, a hill that rises about 300 feet higher and gives 360 degree views of Mounts Baker and Shuksan, Baker Lake and a broad panoply of the North Cascades. On the way back down we took a small side trip down into the Bagley Creek valley, where I got a picture of the small stone bridge that carries the Chain Lakes trail over the creek. You can almost see the bridge, if you look closely. 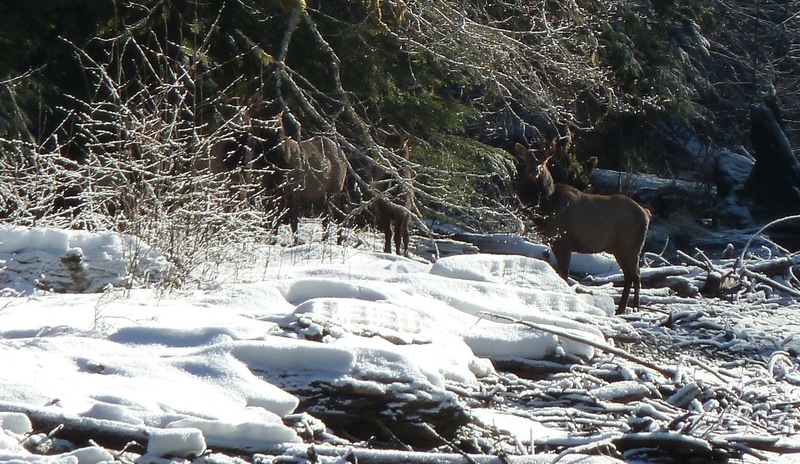 On our way back down the Mount Baker Highway, my sharp-sighted passengers saw a small herd of 5 or 6 elk sunning themselves along the bank of the Nooksack River. Unfortunately, they saw us, too. By the time I could get out of the car to take a picture, they were moving off into the brush. 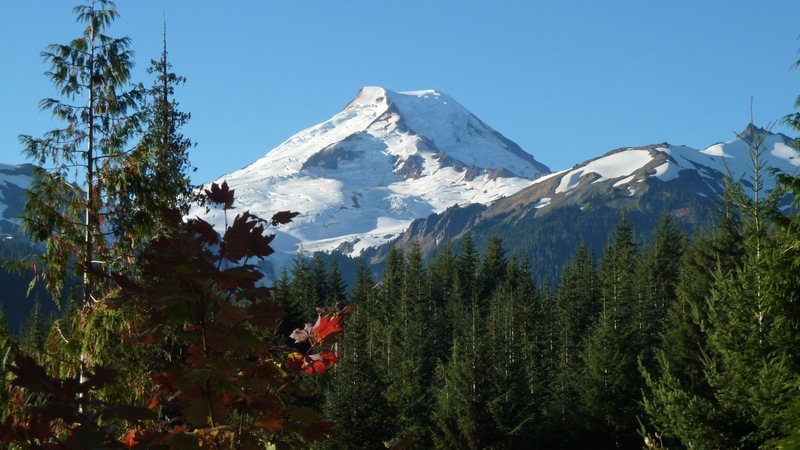 The weatherman is now reneging on that week of fine weather – it is still nice today, but our Thursday hike on Blanchard Mountain, and most of the weekend, will likely be soggy, again. 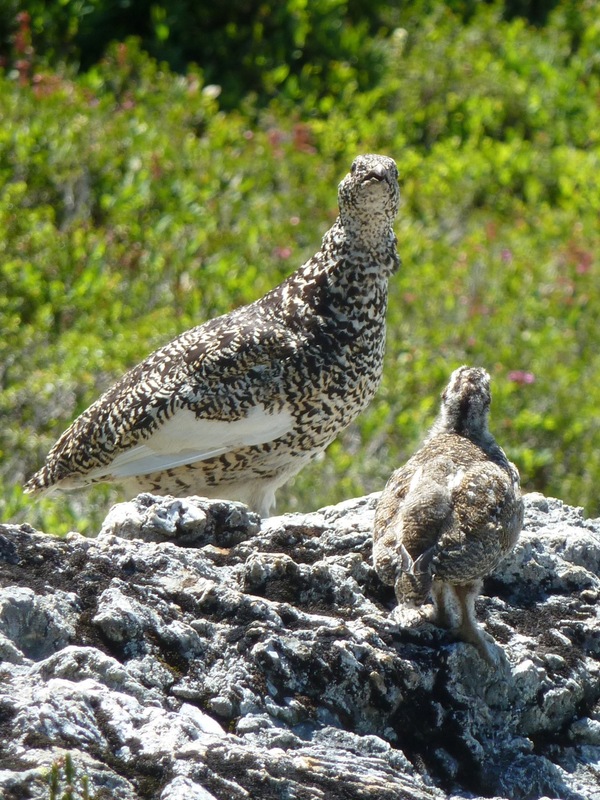 For more on this outing, see Djan’s blog. The weatherman has predicted that this will be a la niña winter which here in the Pacific Northwest means that we should expect colder and wetter weather than usual. I think it is safe to say that he hit this one right on the button. Our customary winter weather consists of a lot of gentle drizzly rain and temperatures in the forties. The most common encounter with snow amounts to some overnight flurries that may accumulate to an inch or so and generally melts by noon. Snow remaining on the ground overnight only happens a few times a year and it wasn’t until last year, after ten years in Bellingham, that I first saw fresh snow falling onto old snow. 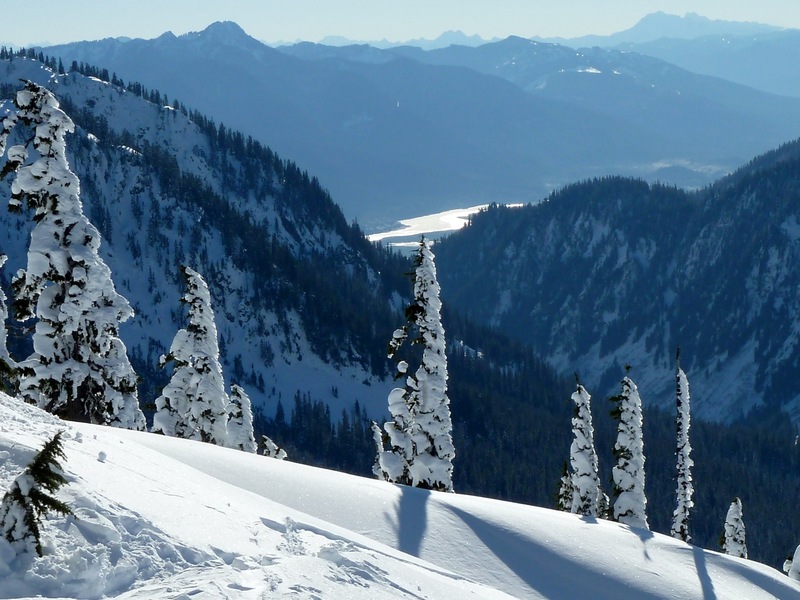 We are subject to occasional bouts of true winter weather due to a peculiarity of geography that allows frigid polar air from arctic Canada to spill over the northern Rockies and drain down the Fraser River valley, which points straight at Bellingham. The river is blocked by a small ridge near the border and makes a sharp right turn toward Vancouver but the ridge is not high enough to stop these air masses. The cold air just barrels right on across the border despite the best efforts of the CBP and when it hits the warmer, perpetually moist air along the coast we have the fabled Northeaster. There have in the past been some truly epic storms that would even make people from Buffalo and Syracuse take notice. But these are extremely rare. The episode I mentioned from last year was a fairly mild one, and the first of any significance at all in ten years. Right now we are experiencing our third or fourth significant snowfall of the season, which is two or three more than usual for the whole winter, so la niña seems to be here for real. These have not been true Northeaster events, although some may have enhanced by some Fraser Valley outflow. 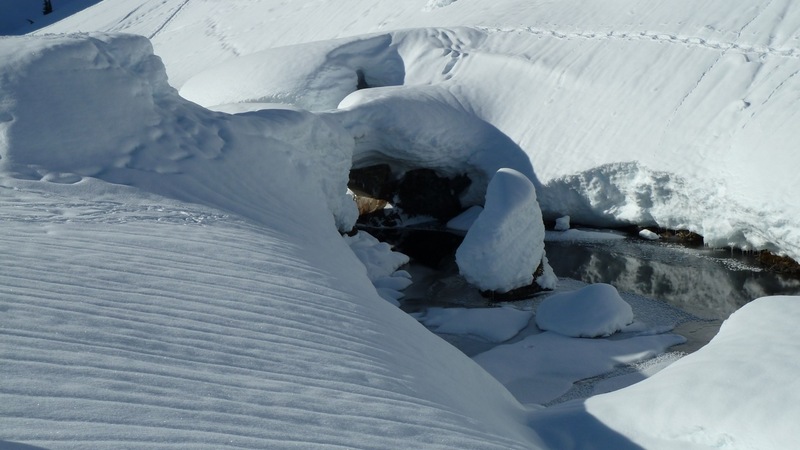 They have been just what la niña predicts – colder and wetter that usual and just enough colder to turn some of our copious winter moisture into snow. 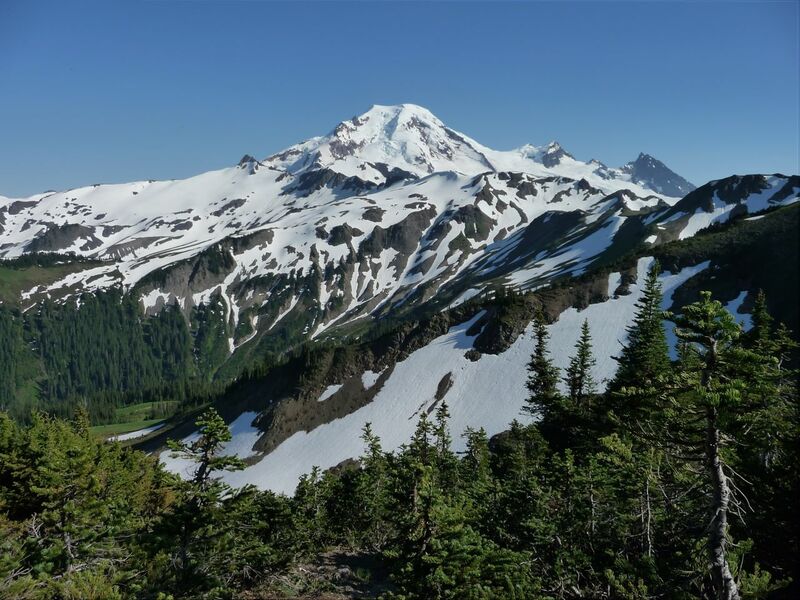 The good news for the Northwest about a la niña winter is that it serves to build up reserves of the snow and ice in the mountains that provide our water supply during our arid summers. [People in other parts of the world may not be aware that we have dry summers but we do, indeed. And don’t tell to many people about it – if they knew how spectacularly beautiful and temperate our summers are they would all want to move here and spoil everything.] 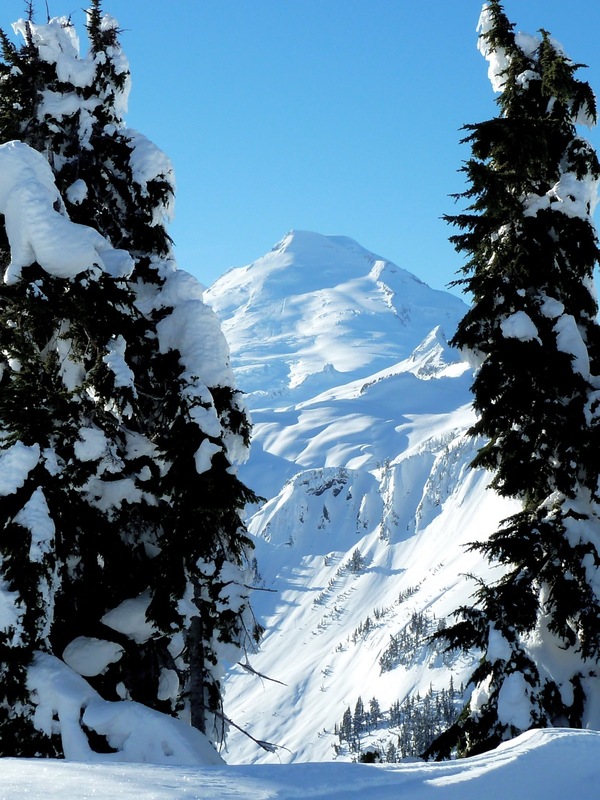 And for those who love the great outdoors that means snow sports! 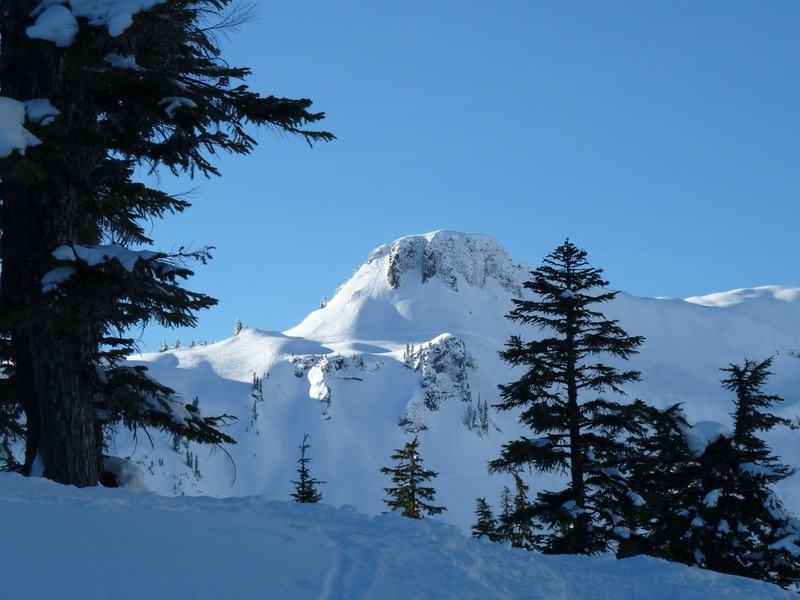 Skiing (both Alpine and Nordic), snowboarding, snowmobiling and snowshoeing are all popular here. Ice sports like skating and ice-fishing are not a big deal, since it doesn’t stay consistently cold enough to develop usable ice near where people live. But even if we don’t have snow in town, we can always get to it if we are willing to drive and maybe hike a bit. 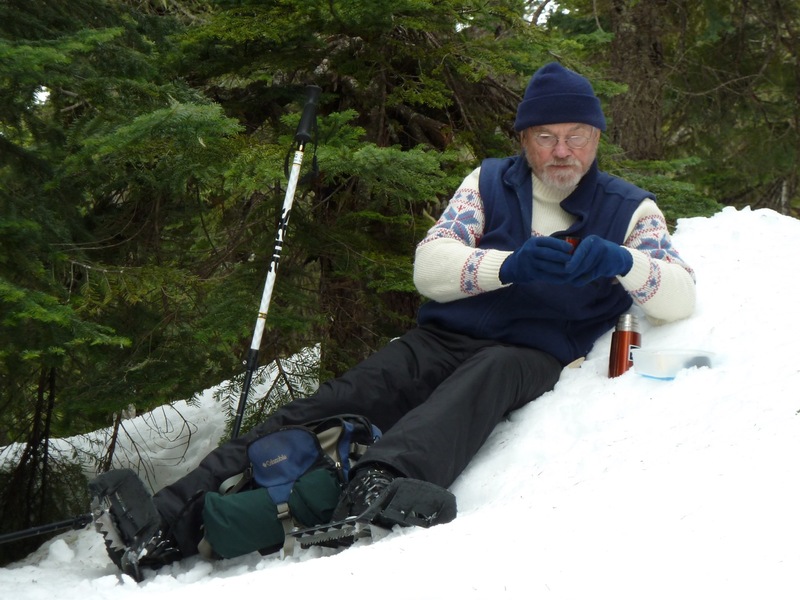 The old geezers I hang out with have to a large extent settled on snowshoeing as the best way to get out and play in the woods in the winter. 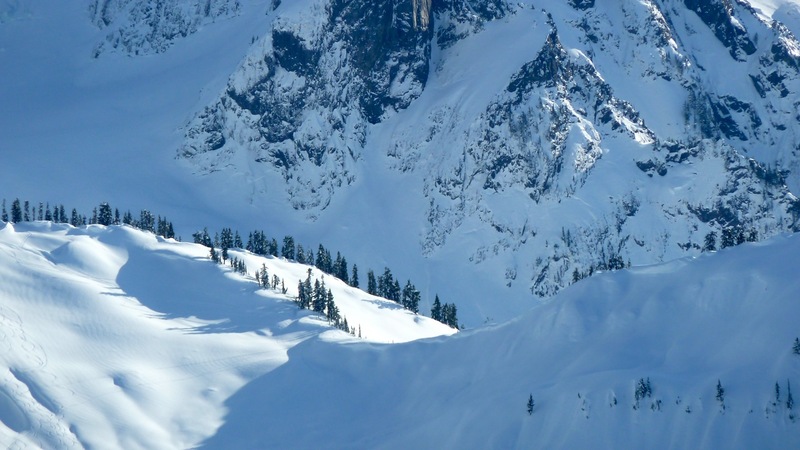 Many have skied in past, but the possibility of broken bones, especially in downhill skiing and snowboarding is not at all attractive when you get to our age and a broken bone can easily turn into a permanent life-altering event. 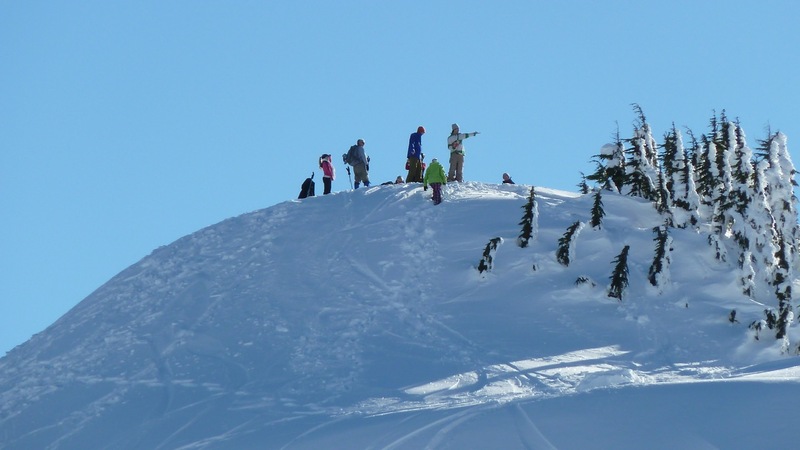 There are also a lot of steep hills, which can cut into the fun and the safety of cross country skiing or limit it to specially groomed trails. 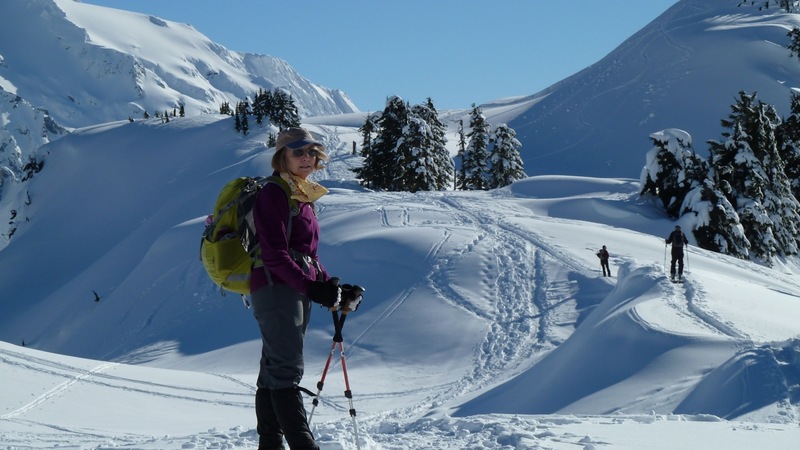 That leaves snowshoeing, which is not exactly flamboyant or exciting, but with some effort can take us safely to some truly marvelous places. This is getting long and I haven’t even gotten to the main event, so I think I’ll post this much for now. 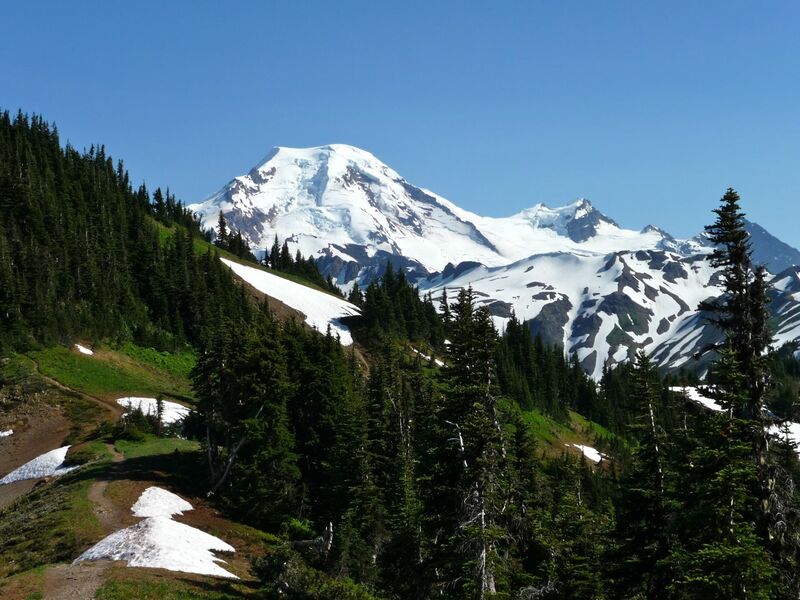 This week for my camping and hiking adventure I chose Skyline Divide and the Damfino area – the access roads for both were just reopened so the Forest Service reports were getting rather stale. I left home about noon on Sunday, set up a camp again at Douglas Fir Campground and headed up Dead Horse Creek Road. The road is in middling condition except for the first mile – someone has spread some very coarse new gravel on the road. This is not soft, crumbly crushed limestone that packs down into smooth surface but big, sharp chunks of some very tough rock – very slow going. About 7 miles in there is a fancy new bridge over Dead Horse Creek (the second place where you cross that creek). The parking are was full to overflowing, but nothing like last week at Heliotrope. 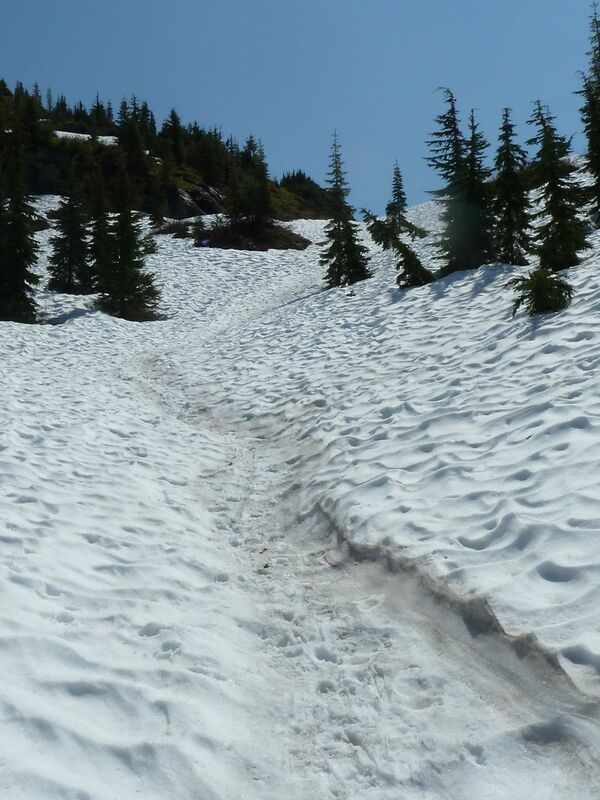 I was only planning to go to point where the trail exits the woods onto the ridge, expecting that there would still be some snow travel, but the trail was entirely clear, except for a few leftover snow puddles. So there I was on the ridge at 4PM, with perfectly clear skies, spectacular views and five more hours of daylight. 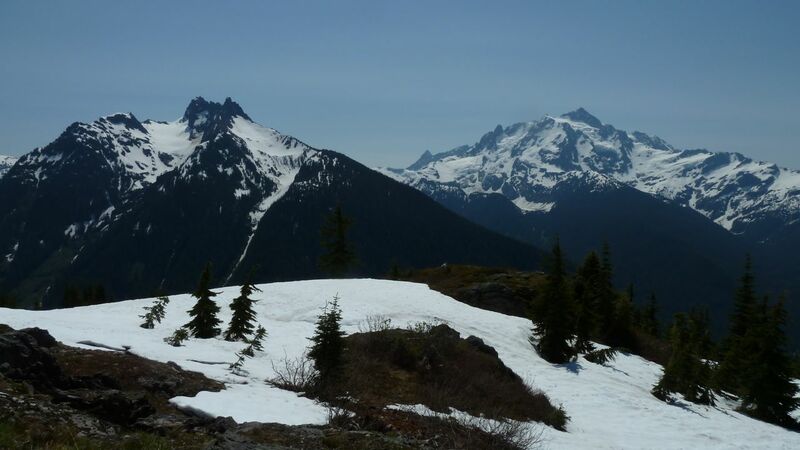 I could see some good-sized patches of snow along the divide, but nothing that looked dangerous, so I did some figuring and decided that I could hike out toward Mount Baker until about 5:30 and make it back to the car by 7:30 and to camp for dinner at 8:00. The afternoon light on the mountains was as good as I’d hoped, with the lengthening shadows giving a richness that’s missing at noon. I ended up doing almost 8 miles, after intending to do about 5. I was dragging a bit by the time I got back to the car, but no regrets. As I drove down the long, long 12 miles to the highway, a big bird jumped up from the ground and settled in a tree right along the road. What was left of the sun was right behind him, but I am sure that it was an owl, probably a Barred Owl. This was a first for my life list, as I’d never seen an owl of any kind in the wild before. When I got back to the tent I decided, for the first time ever, not to put up the rain fly. Often I use it for warmth as much as for rain, but it was such a mild evening that I probably could have just sprawled out on the picnic table. After a nice night in the tent I made breakfast and packed up the camp. Last week I left the camp set up and got to the trail a half hour sooner, but then had to rush to get back before check-out time. This time I had a long 15 mile drive to and from the trailhead and planned a nice, leisure stroll up to Excelsior Pass and didn’t want to be watching the clock. There are three trails starting at the Damfino trailhead at the end of Canyon Creek Road: Excelsior Pass and Peak, Boundary Way and Canyon Ridge. We could do one of these this Thursday before they close the road again on August 2 for another month. I had chosen Canyon Ridge in my mind since it had been reported as free of snow for several weeks, Boundary Way is really short, and Excelsior is really gorgeous in the fall. Since my cover story for these Expotitions is that I am testing the trails for the Trailblazers group, I really should have done Canyon Ridge. But after my almost 8 miles the evening before, I wanted a easy, pretty hike. You can see a good bit of the Canyon Ridge trail right from the trailhead, so I figured I would have a pretty good idea of the snow conditions without walking the trail. And then, at the trailhead, I happened to run into a pair of Forest Service rangers who happened to be headed up the Canyon Ridge trail and said that they would be filing a report at the ranger station in Glacier by Wednesday. So I was off the hook completely and headed for Excelsior. 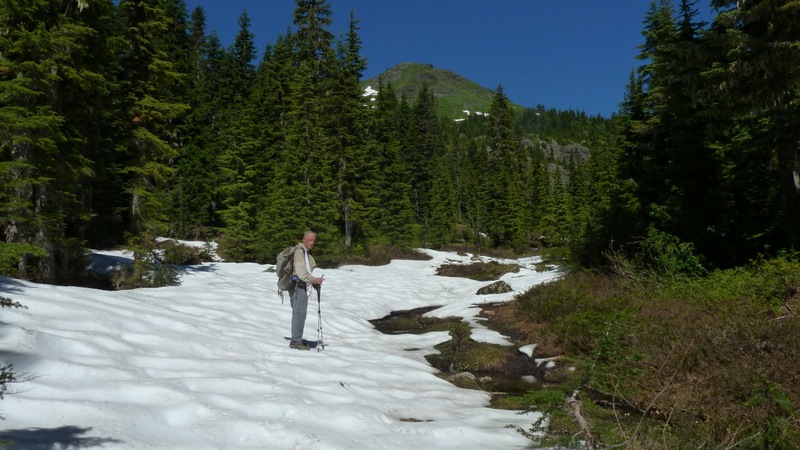 There are still some pretty big snow islands along the trail, including one that was large enough to make me pause and hunt for the trail, but not enough to amount to a problem. And as I left the woods and approached the pass and High Divide the snow largely disappeared, so this trail is definitely ready for prime time. After I’d had a snack at the pass it was still only 11:00, so once again my plans had been too modest. I could hike up to the peak, but that’s just another sunny spot with a marvelous view (ho-hum). 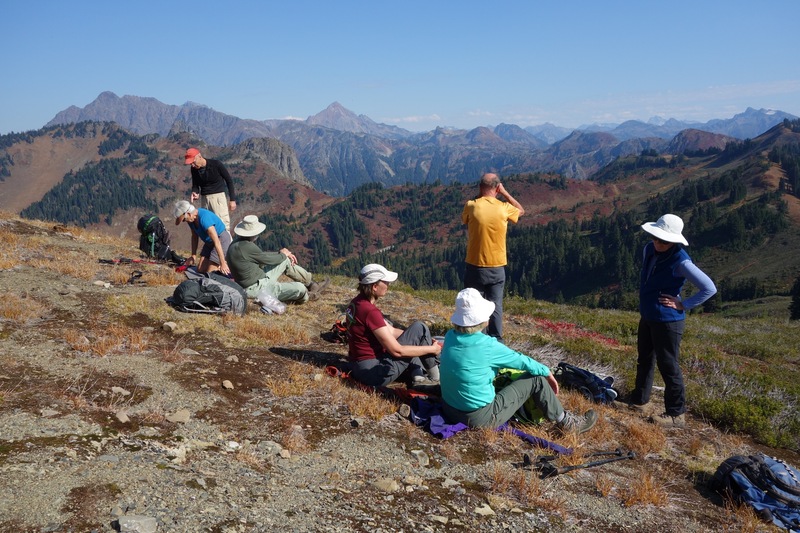 I had hiked west along the ridge toward Church Mountain, but I had never hiked along the official High Divide trail, which runs to the east along the divide to Welcome Pass. So I picked an arbitrary time and decided to hike east until noon. On such a beautiful day, the High Divide trail is a joy. 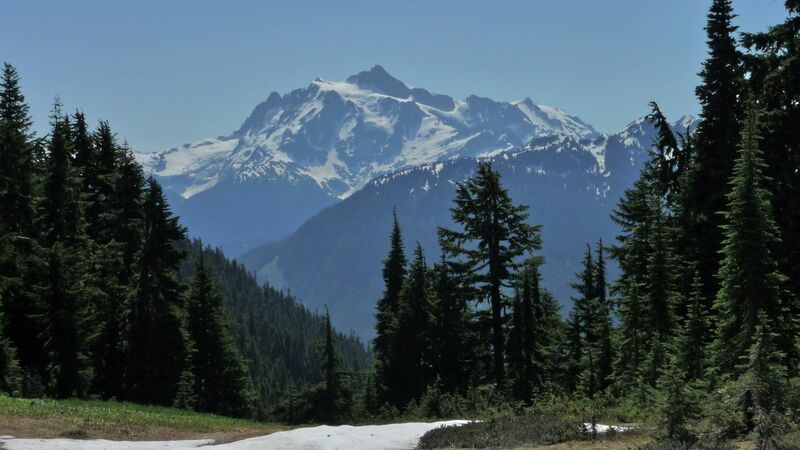 It rambles up and down, but not very steeply, on or just south of the spine of the ridge, occasionally passing through some trees, but mostly with unimpeded glorious views south across the Nooksack Valley to Mount Baker and all his Friends and Relations. Just before noon I passed a high point just before a deep notch in the ridge exposed a view to the east and decided to stop for lunch. At this point I realized that I hadn’t brought any real food with me, just a few Clif bars. And that my right ankle was beginning to hurt, due to newish boots. So I sat and enjoyed the view and headed back. In the end my little stroll had turned into nearly 10 miles with 2500′ of elevation gain. It was a little overdone, given the hike the evening before, but I highly recommend it. It is not nearly as tough as Church Mountain and a lot of our other hikes and most of the time is spent in alpine country with great views. And the flowers are coming out! Bugs are beginning to be in evidence. On both hikes I was pestered by some large insects that I assumed were deer flies, but I never got a good look. Or they could have been bees, which I did see now and then. On the Skyline trail, one fly managed to take a bite out of my shoulder right through my shirt, but that was the only clear episode of carnivorous behavior. 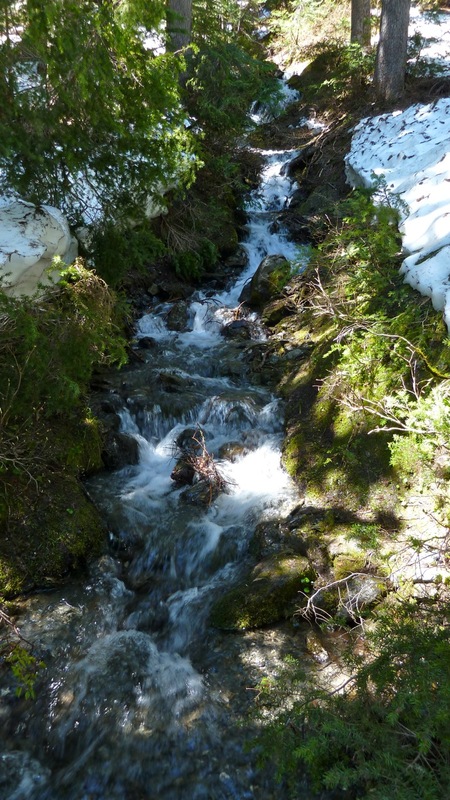 It seems that most trails in the North Fork region are now clear of hazardous snow, and from now on we can probably pick any trail that we can get to. That was a lie. 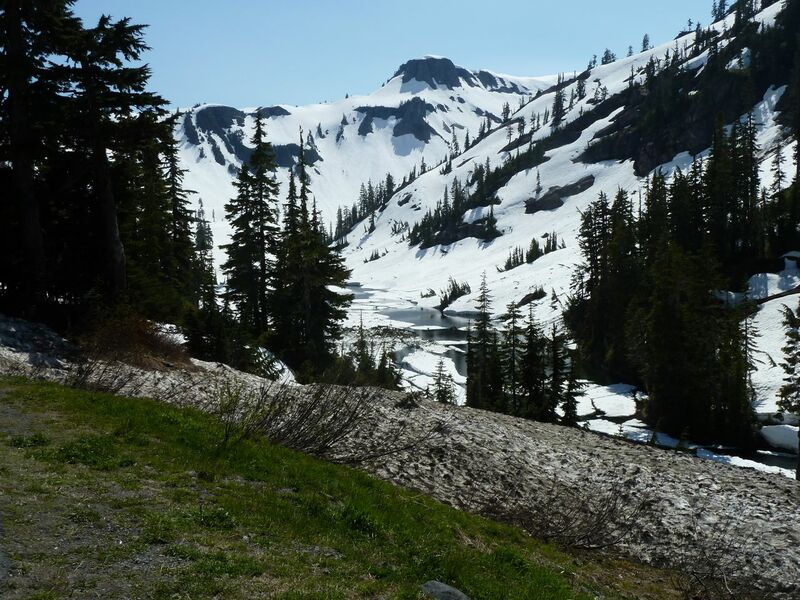 The road to Artist Point is supposed to open on Friday, but since the DOT has been barely able to clear a narrow track in three weeks of concentrated play with their big Tonka trucks, I’m thinking that those trails may still have more than a bit of snow. Aha! I think I know where I’m going next week! With my ice axe.